Our client testimonials and case results below are intended to provide greater insight into the breadth of legal services provided by the Firm. 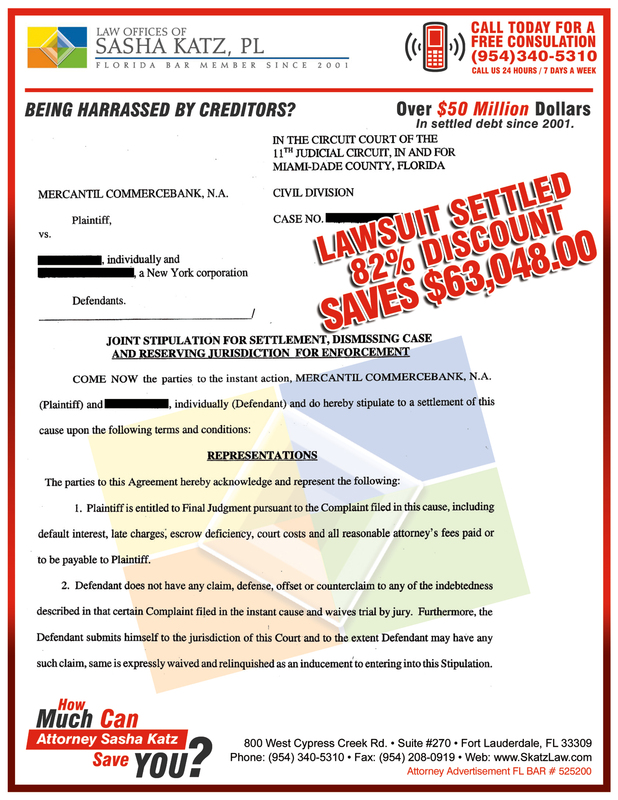 The results are not necessarily representative of ALL clients or others with the lawyer/firm. Every case is different, and each client’s case must be evaluated and handled on its own merits. Sharing our burdens and encouraging one another is just as important as sharing our Blessings & Victories. I Pray You are Blessed & Encouraged as I share this Christmas Blessing the kids & I received. I was in a Car Accident on the afternoon of April 26th on my way home from a Bible Study. I’m grateful It happened while my kids were in school & Praise God No One was hurt, but my Car wound up being totaled. 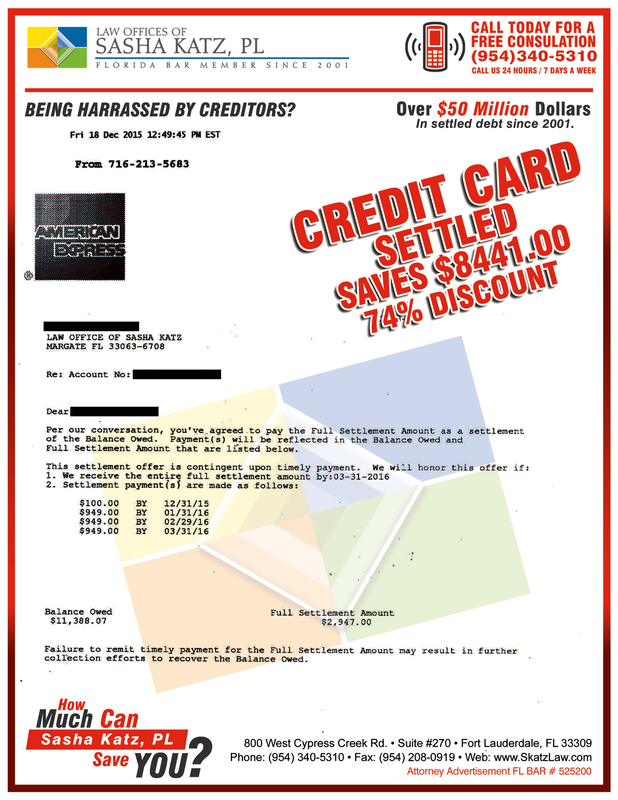 I received a small settlement from the Car Insurance, but I knew with my budget I couldn’t afford to purchase a car & make payments so I waited. 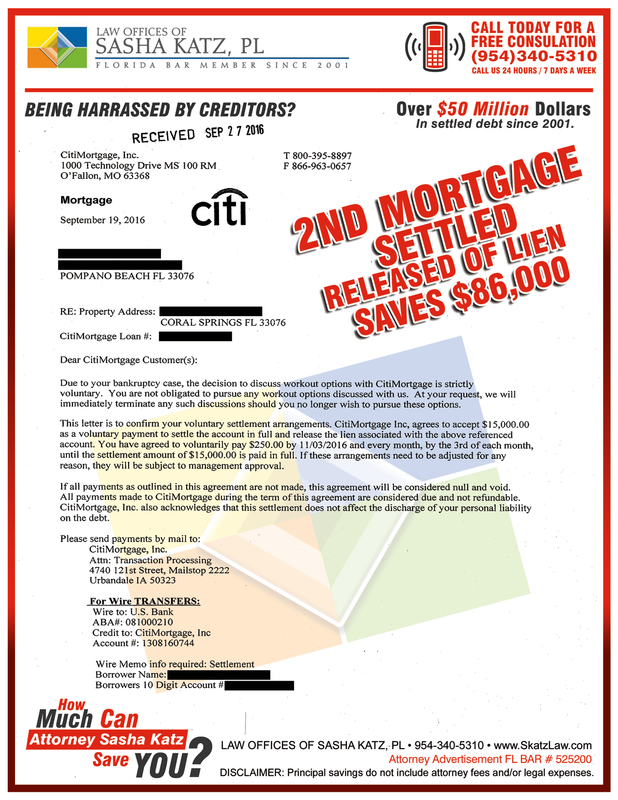 About a week later I received a letter from Citibank which notified me the Balloon payment of $105,000 was due for the 2nd Mortgage that my late husband had taken out. 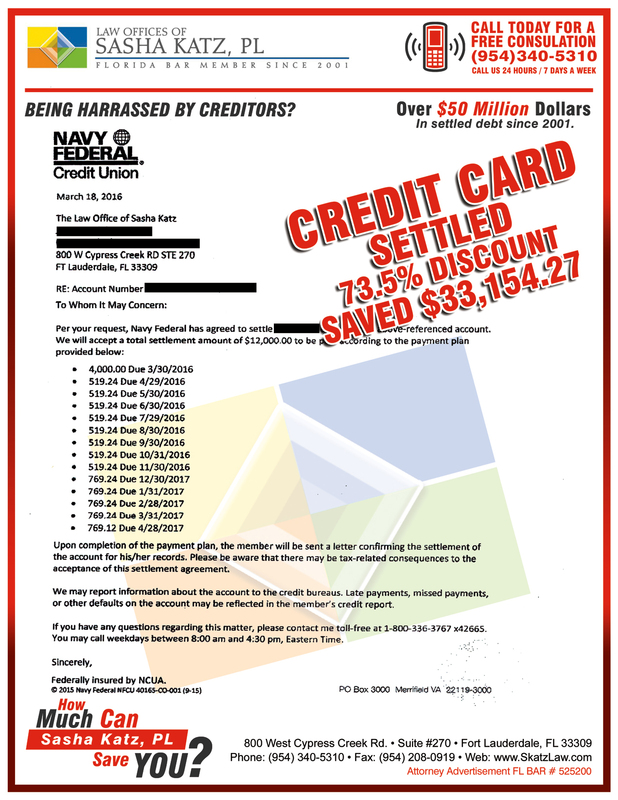 I was still in shock of losing my car, now I was facing losing my home and the $4,000 car settlement I had wasn’t going to make a dent in the amount that was due! They say, When life knocks You to Your knees, You’re in the perfect position to Pray. I’ve faced many challenges in the last 4 years, but I am grateful because each one of those challenges has strengthened my faith & drawn me closer to God. Now when Anything happens My 1st Response is Always PRAYER! 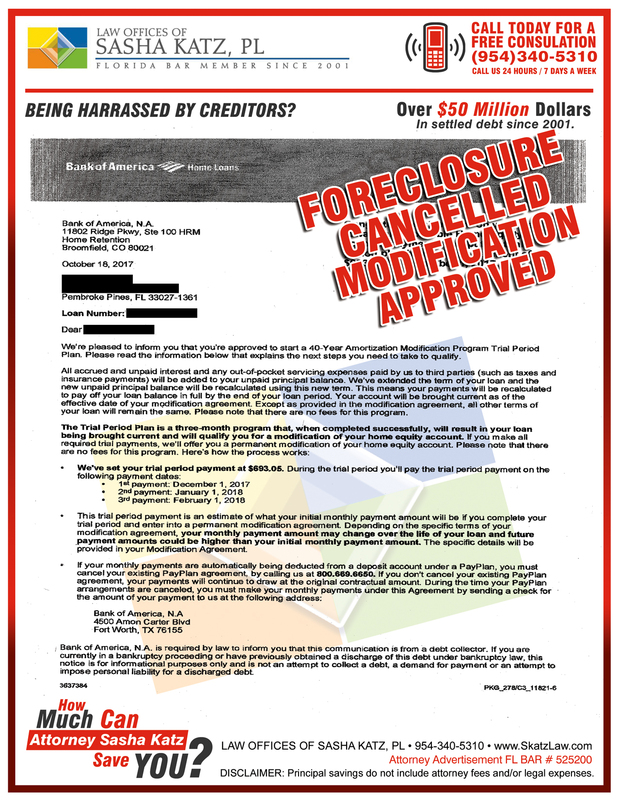 This letter is to explain my recent experience with my mortgage lender BSI. 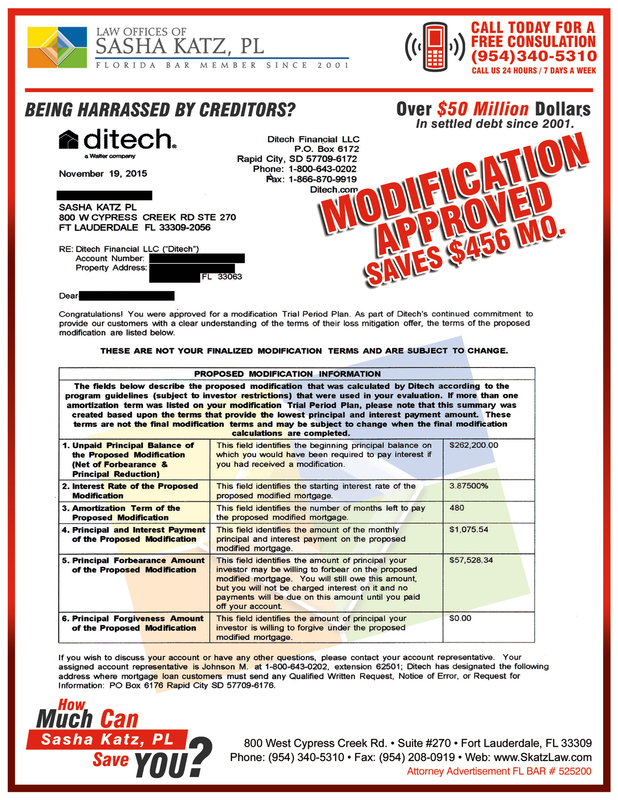 In October of 2014, BSI requested a copy of my flood insurance policy which I faxed to them no less than 5 times! 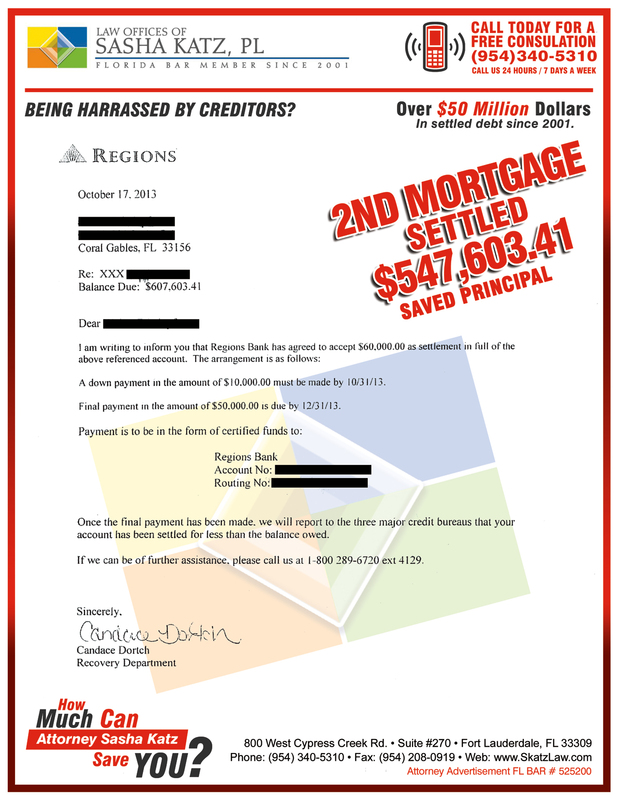 I assumed everything was OK until my mortgage payment skyrocked from $1700 to over $2400. BSI claimed their was an escrow shortgage of $5711 to replace a policy that A, never lapsed and B, was 3xs the cost of my exisitng policy. If you Google BSI + Forced Placed Insurance Scam , you will see many instances of people going through the exact same thing as I did. 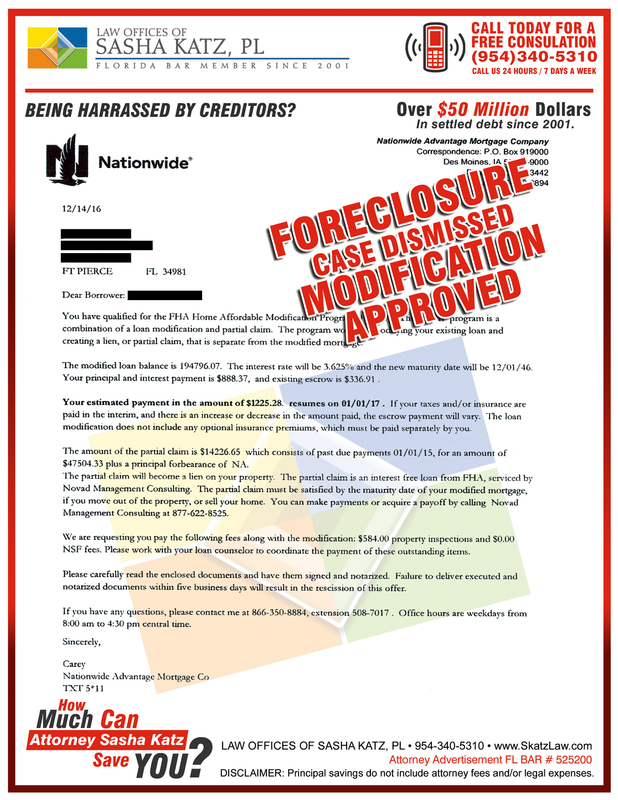 After months of sending letters, faxes and phone calls, BSI “Escalated My Case” to a Supervisor who recommended I resolve my default by applying for a loan modification. I refused to waste my time to resolve their error. So, I continued paying my agreed upon payment of $1700. 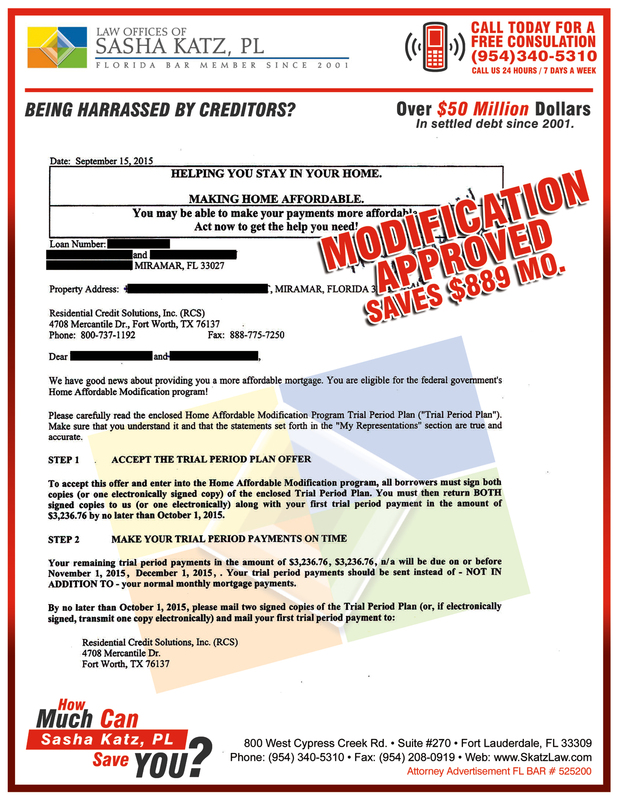 Three months later I received a forelcosure notice. 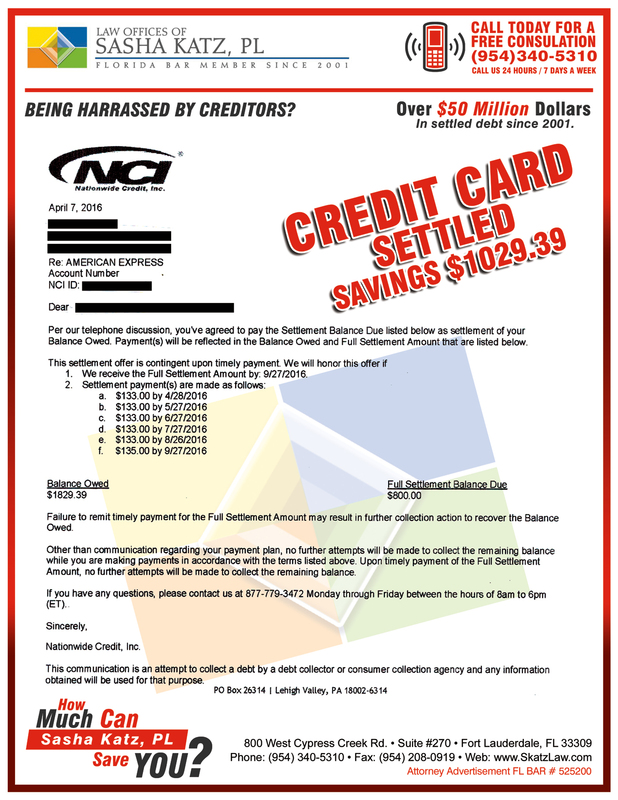 I’m 100% sure that my BSI was trying to steal my property with their crazy insurance scam. I was recommended to Attorney Sasha Katz by Calvary Chapel Fort Lauderdale and I was thankful for the introduction. 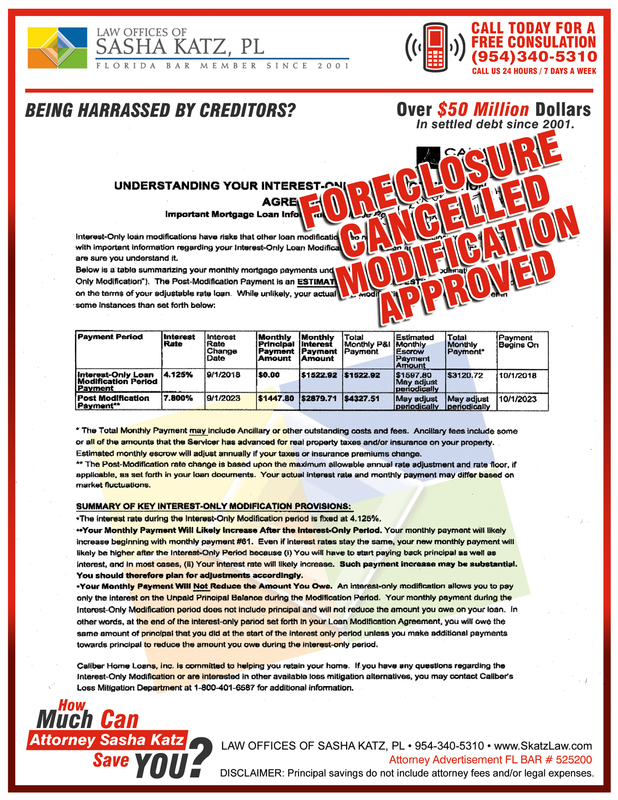 Bottom line is you need an experience attorney that recognizes the lender scam and who is ready to fight to save your home. 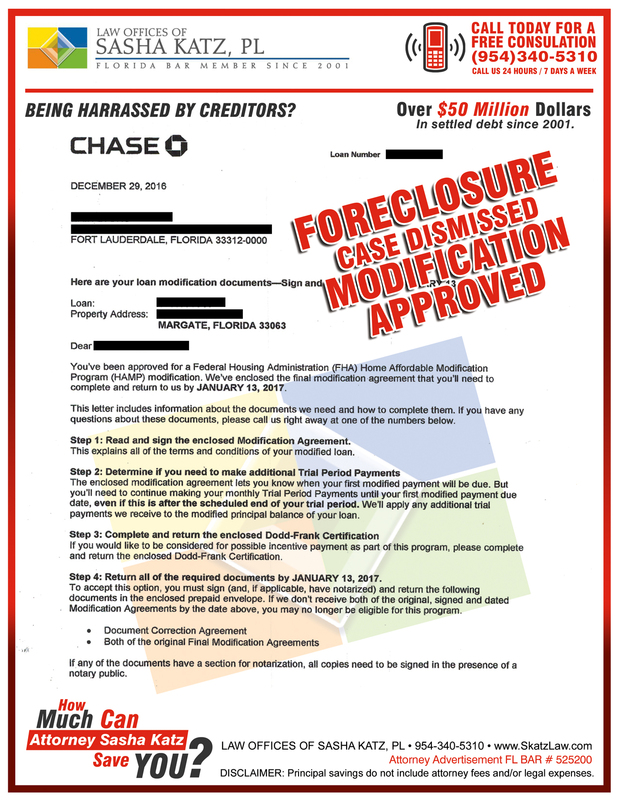 I cannot thank Sasha Katz enough for saving my home from foreclosure. My name is William. In February 2008, my world imploaded!! My wife was diagnosed with terminal cancer (We had no health insurance, as she had cancer 25 years before). 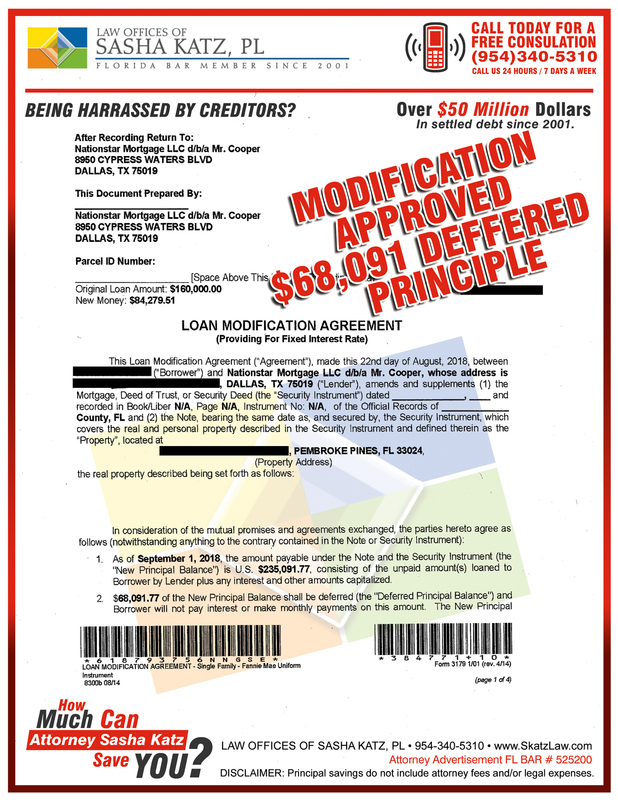 My construction business went out of buisness due to economic downturn, and my 2 year-interest only loan came to the end. 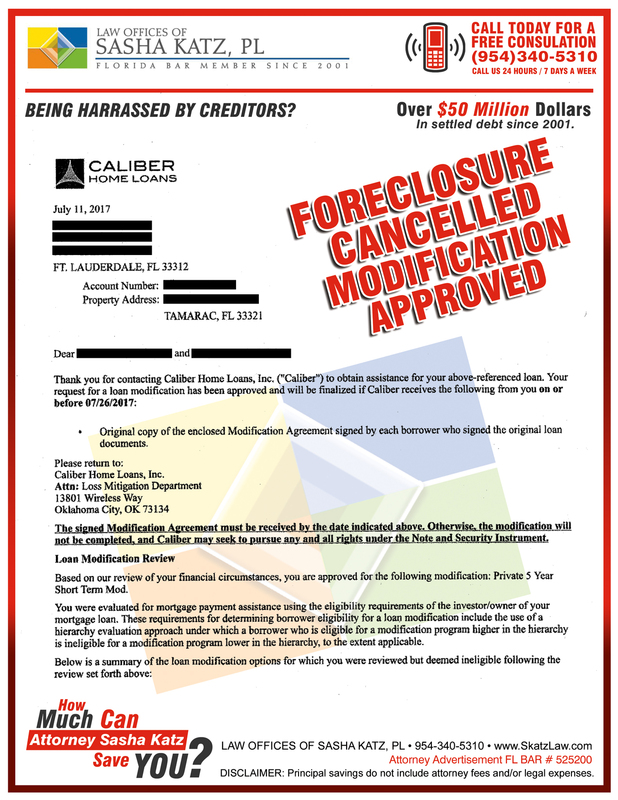 I reached out to my lender for help and instead of getting the long term – low interest mortgage as promised, I was denied and my loan was sold 3 times which caused me start the process over and over again. 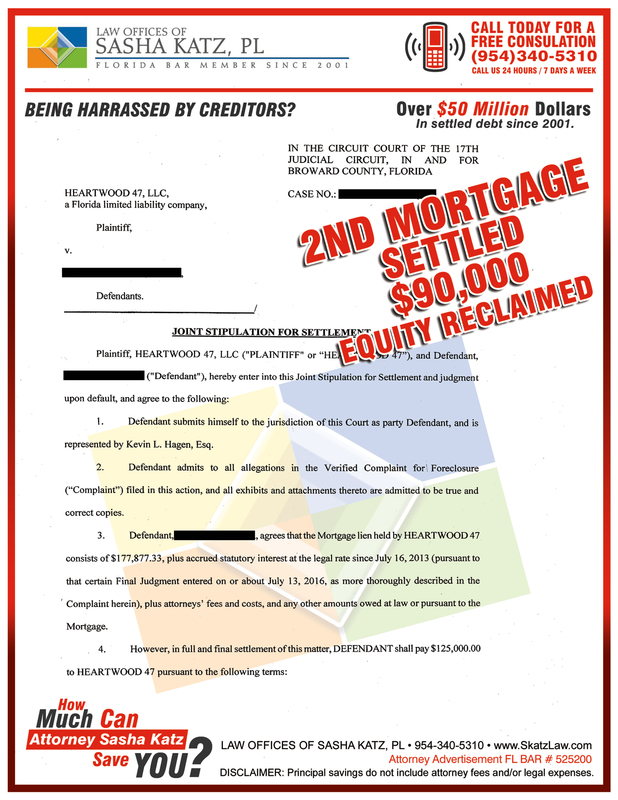 The final buyer of my loan told me they were no longer participating in HAMP, leaving me out in the cold. 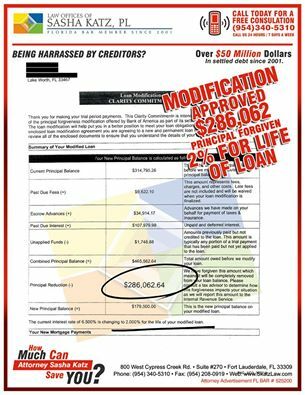 With almost $92,000 of interest paid, the lender would do nothing for me to change the mortgage to one that I could afford. 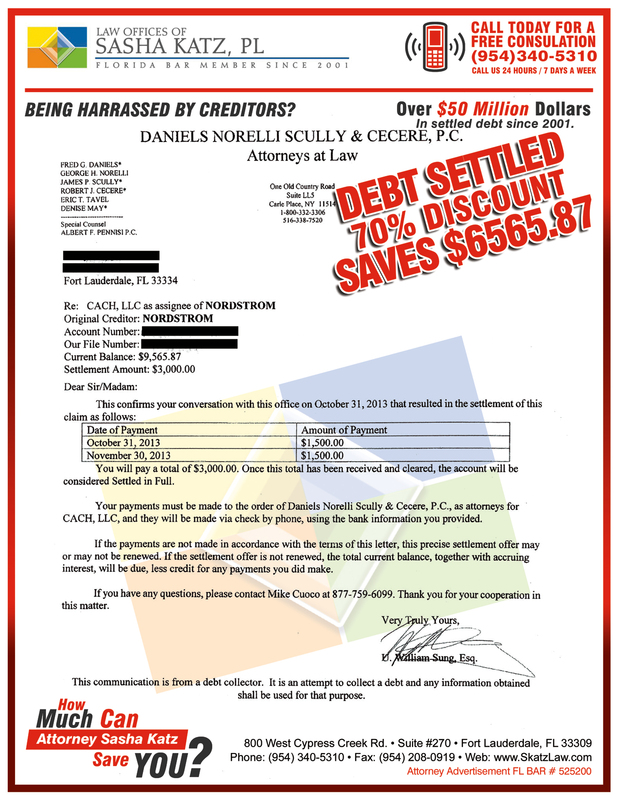 Finally, I gave up and was referred to Attorney Sasha Katz. 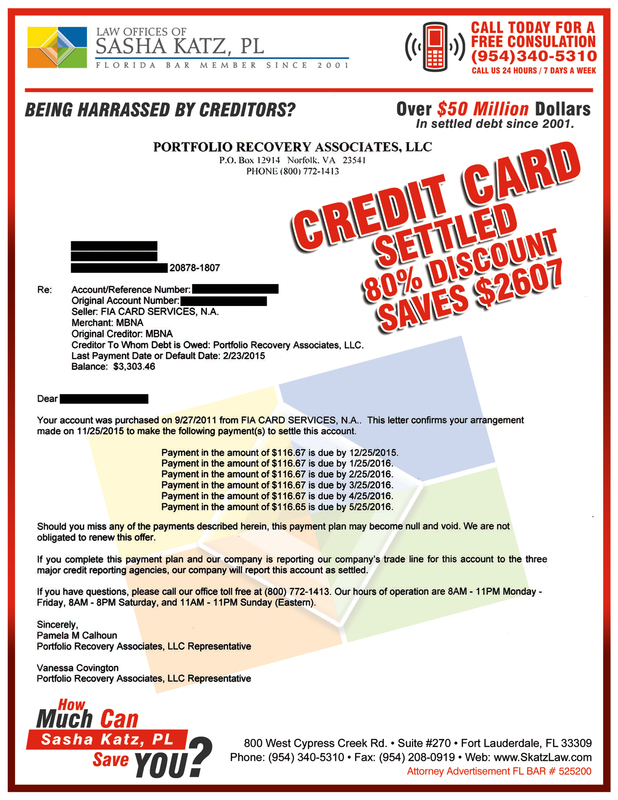 Her firm somehow got the bank to agree to review my financials for a loan modification and even stopped my sale again for the 11th time. 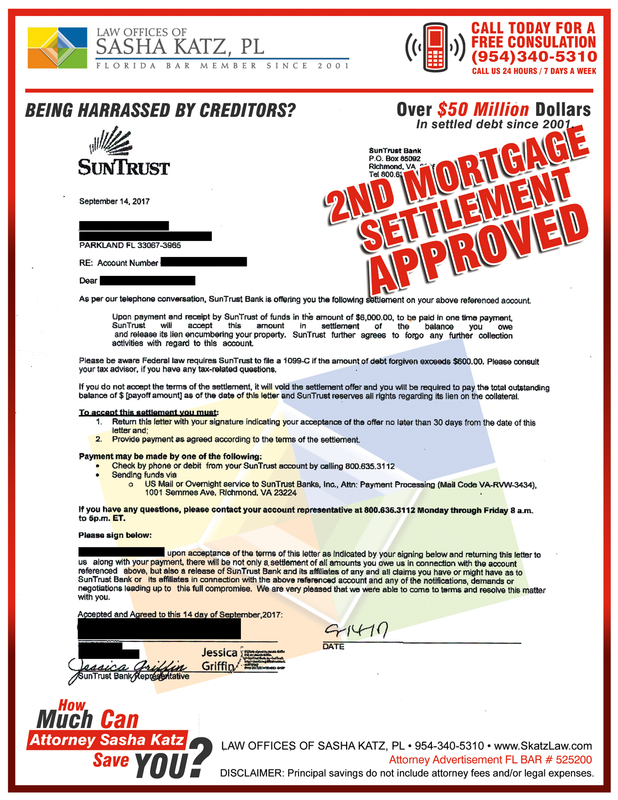 All of this was due their communication with the mortgage underwriter and providing them all of the documents they requested. Unfortunately, they rejected me again. 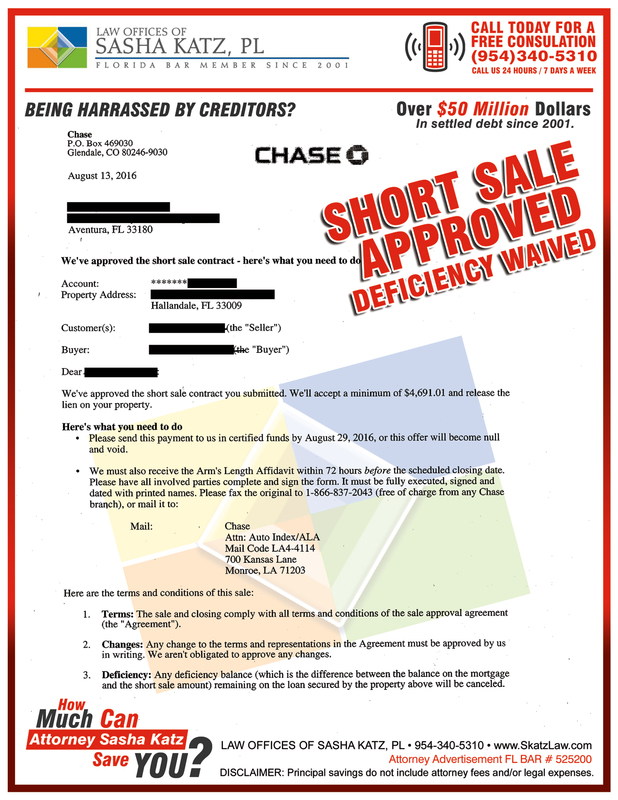 At that time we decided to try and short sale but the District Judge that gave us the last extension refused to extend the sale date, even though we had a cash deal that the bank accepted and approved. 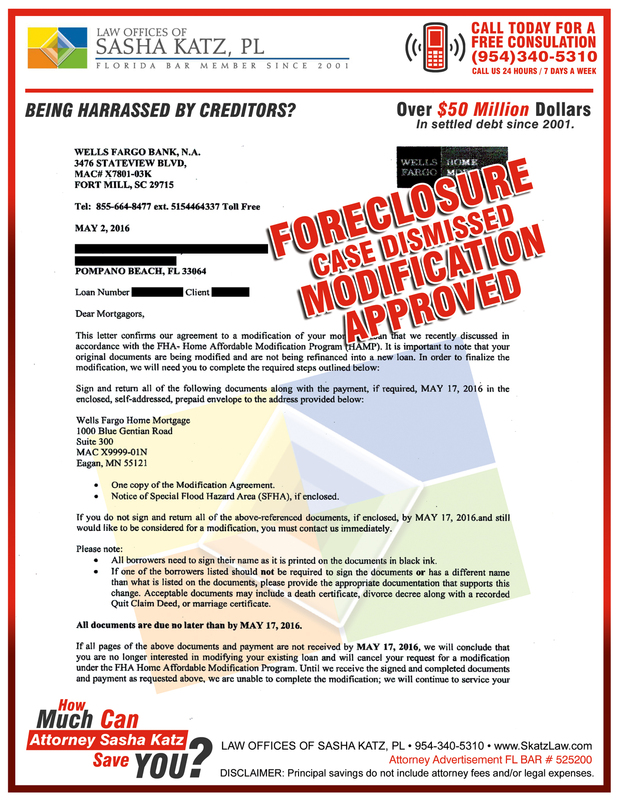 The Judge rejected snd foreclosed on Dec. 9th 2015. So much for our justice system! In spite of the outcome, I couldn’t be more appreciative of Sasha & Eric Katz’s personal and professional effort on my behalf. 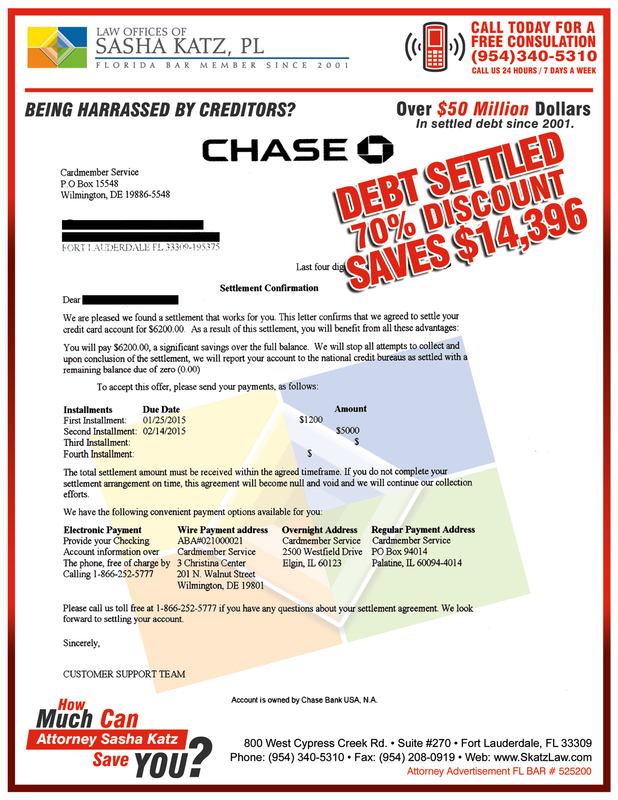 He forced the bank to do what I could not get them to do, communicate with me. I am so thankful to have been referred to such an awesome law office. 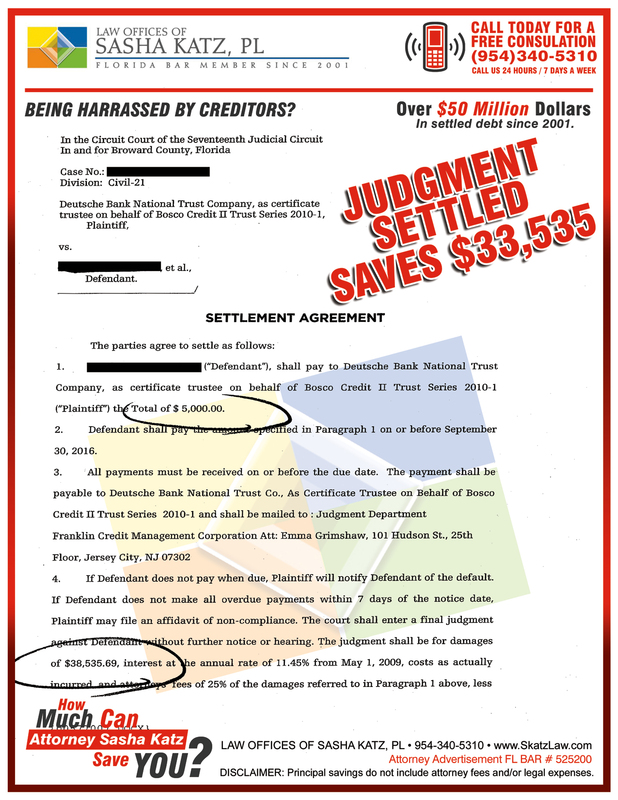 I was surprised to discover that a judgement had been filed against me in court regarding a debt and I did not know what to do. As soon as I was told about them, I immediately called and right away I felt at ease. Eric made the whole thing seam effortless ! 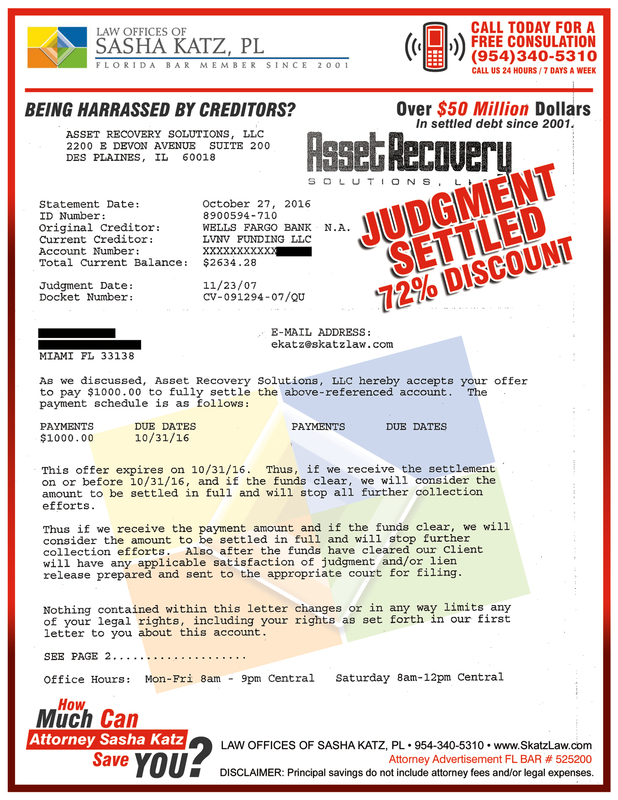 They have been able to come to a settlement agreement out of court and Sasha was able to get the entire case dismissed for me as well! Most compelling is the integrity and character I noticed – they make you feel like your issue is the most important one and are willing to spend the time with you needed to put your mind at PEACE. I highly recommend this Law Offices of Sasha Katz to anyone – they are a true blessing and certainly a STANDOUT among the rest! Thanks for the update and your congratulated message on our recent modification. Jan and I want to say thanks to you and the team for your efforts in making this happened. 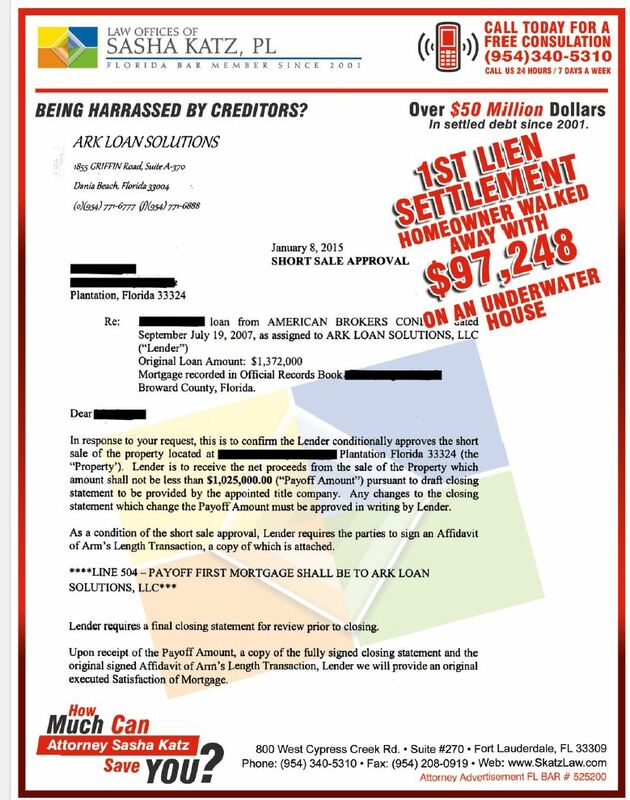 I also ensured that my part was done timely and expeditiously in regards to the documentation request from the Lender from time to time during the process. This has been a great and rewarding experience for us and we’ll do our best to avoid this situation going forward because of the stress and pain associated with it. Well done team! Excellent client relationship, Staff is professional and at the same time so sweet. Would highly recommend Atty Sasha Katz Law office the make you feel like family. I have recommended Sasha to 2 people and will use her again when we need. Sasha Katz, Esq. did a great job with my case. Thank you! The staff not only accomplished exactly what they said they would in my case, but also provided me with confidence and a sense of security during and after everything had been completed. 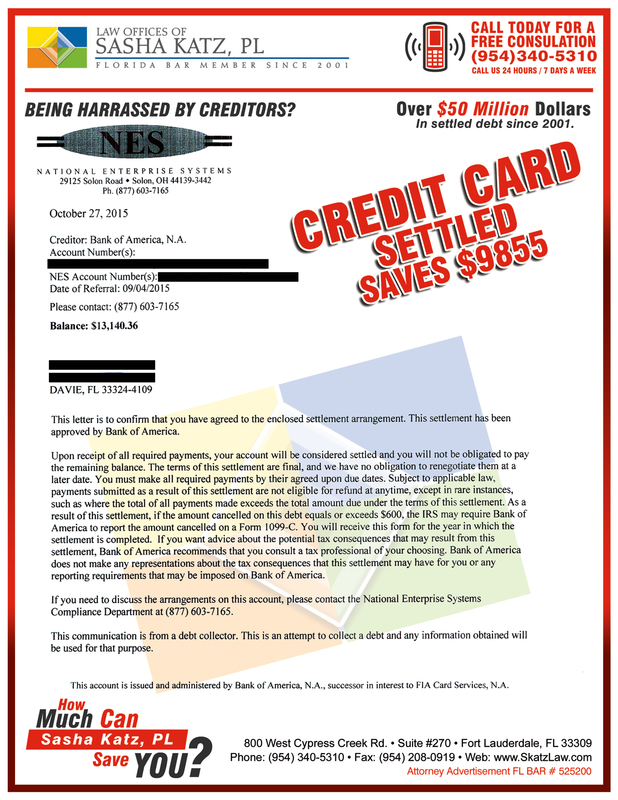 Although I do not have a need for legal assistance, they expressed their continued support if I ever need it again. Very cooperative and easy to work with. Both of the realtors (mine included) involved in the sale of my house did a horrible job! Things were getting uncomfortable with respect to my real estate contract. I was referred to Attorney Katz by a friend. Sasha imemdialty stepped in and took over the file. She had everything corrected and just did a wonderful job. She was GREAT! 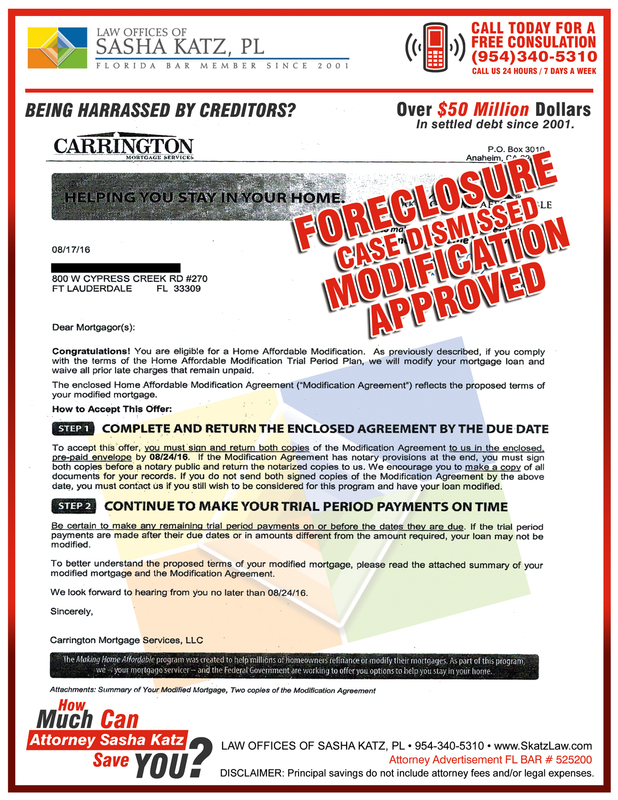 I was very impressed with the firm on events leading up to our closing, and the actual closing itself. Sasha Katz, Esq. is a true professional. SURVEY MONKEY – “Thank you so much!!!! Dealing with this law office gave me peace of mind. I have been a client for many years and enjoy a special relationship of mutual respect and friendship. SASHA AND HER TEAM ARE THE ONLY PEOPLE TO GO TO IF YOU WANT EXTREMELY POSITIVE RESULTS. I cannot say enough about how pleased I was with Sasha’s services. And Robin is a sweetheart. Together they make the greatest legal team one could ever work with. I’m a former client that has come to realize and accept that advice given was exactly correct…sometimes it just takes time to get out of denial and have courage to do what needs to be done. Sasha Katz’s and her entire team have been superb throughout the closing process of my home. Highly recommend! SURVEY MONKEY – I’m very satisfied with the services that I’ve received and I just want to take the time to thank Sasha Katz and her colleagues for everything they’ve done. Sasha Katz and her firm are extremely professional and always go the extra mile to ensure that their clients are satisfied. Again, Thank You Sasha Katz. YELP TESTIMONIAL – I met Sasha and Robin at her office for the closing of my new home. This was my first time meeting Sasha. Closing for me, was not an easy situation…lots of emotions and numbers, figures and information! However, Sasha explained everything to me, she went line by line to let me know where my money was going and to whom. 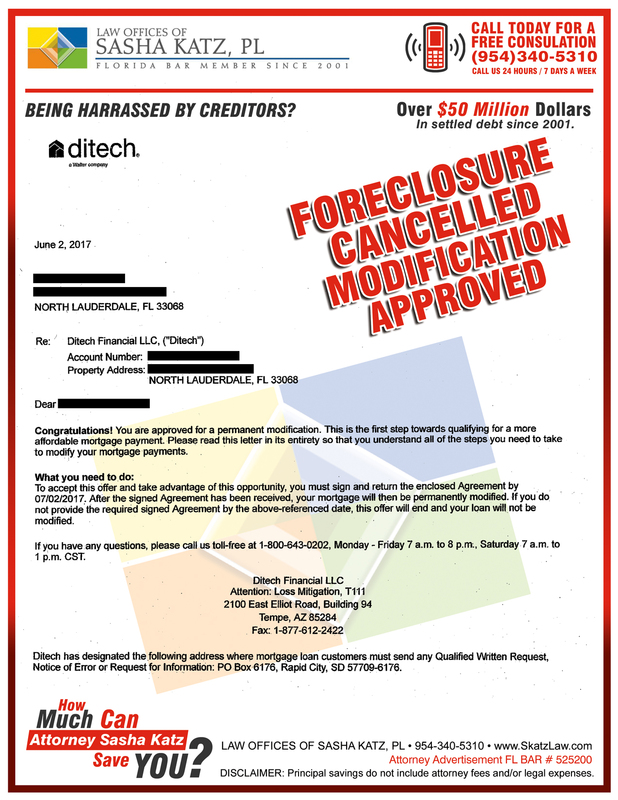 All my questions such as how do I connect FPL, water company, homestead exemption and so on…were answered and she even faxed over my information to FPL for me! Sasha and Robin were so nice and helpful. I felt like I was in a room with my family and not an attorney. After closing, I asked Sasha what other types of law does she practice. 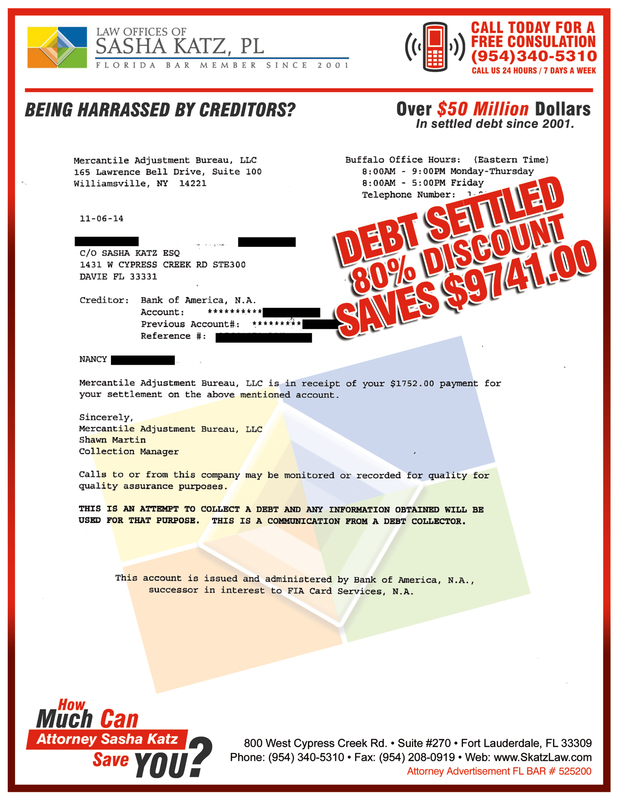 Upon learning that her office also deals with debit collection, and so on… I sought out her advice on a personal debt matter. This is when I was introduced to Eric… Talking to Eric was like talking to my Brother…he is so nice, friendly and down to earth. I felt real comfortable explaining my situation with Eric. All I have to say about Eric is THANK YOU $6,500 times!!! 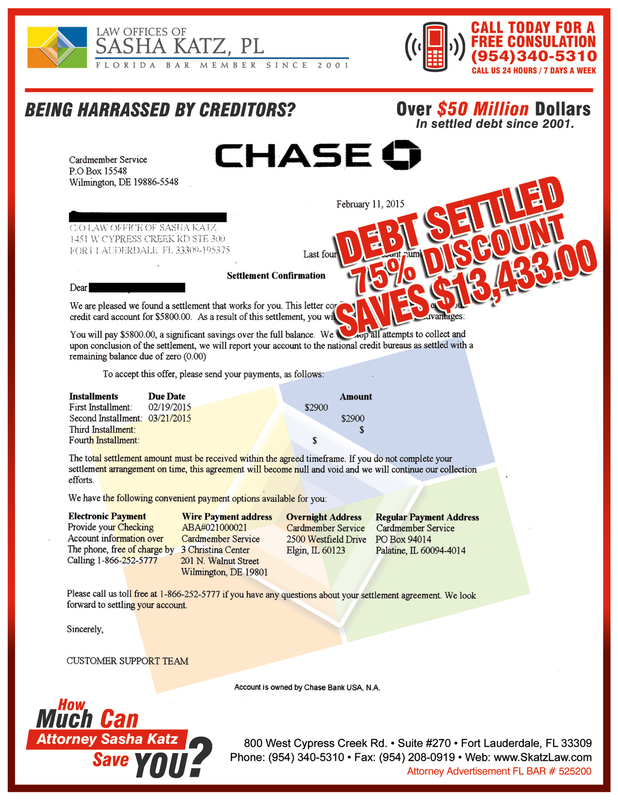 This is what he saved me as well as my credit being in good standing!!! It may seem like a small amount to some but to me it’s Hugh. I think it’s also great that the office gives back to charity and if you use their service like I did for my closing, they give you a few choices of organizations that they will donate to! Picking an attorney can be taxing, I was fortunate to have had this office on my side. My real estate agent, Donna Gardner recommended this office and I’m glad she did. I want to thank, Sasha, Robin and Eric. You were all great!!! and I thank you. 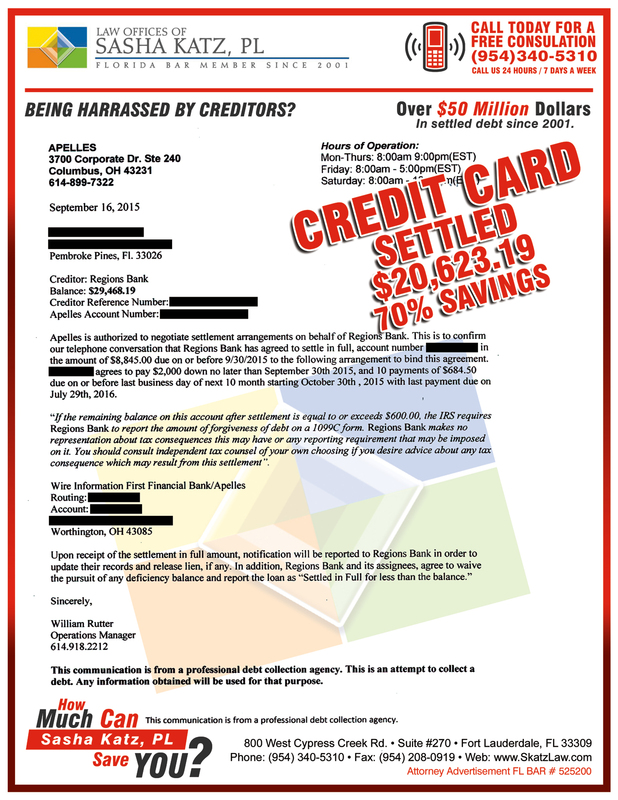 AVVO TESTIMONIAL – We heard about this firm on the radio and were Very interested. We went into the office for a consultation and were put at ease. She helped us keep our house from going into foreclosure. I highly recommend her services. Honest and affordable. Words cannot say enough about how we were treated and her level of professionalism. Great listener, caring and extremely helpful. WEBSITE TESTIMONIAL – The office of Sasha Katz is a trusting, organized get it done Law Firm. 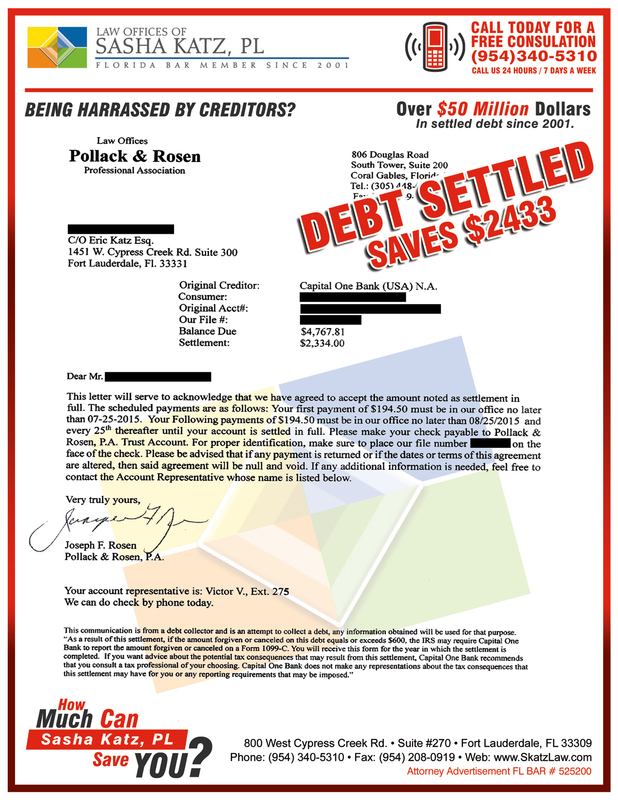 We are extremely satisfied and have, so far, achieved our goals in getting ourselves back to the road of financial freedom. Sasha Katz is an amazing lawyer. YELP TESTIMONIAL – I met Eric and Sasha about 2 years ago and set up an appointment in their office to review my situation. 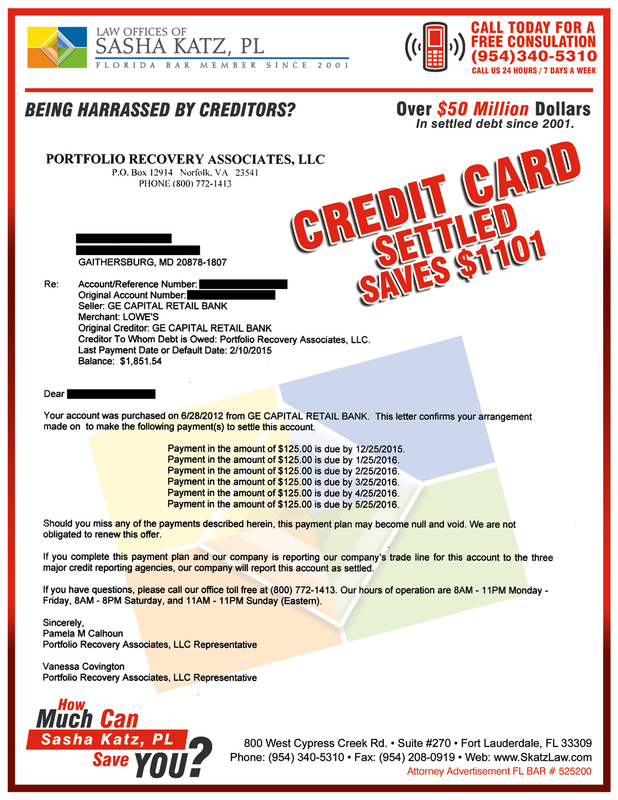 We were in a situation that needed some professional help and that’s exactly what we got. Real professional advice.!!! Sasha took control of our case and explained what we could expect as far as avoiding losing our home. 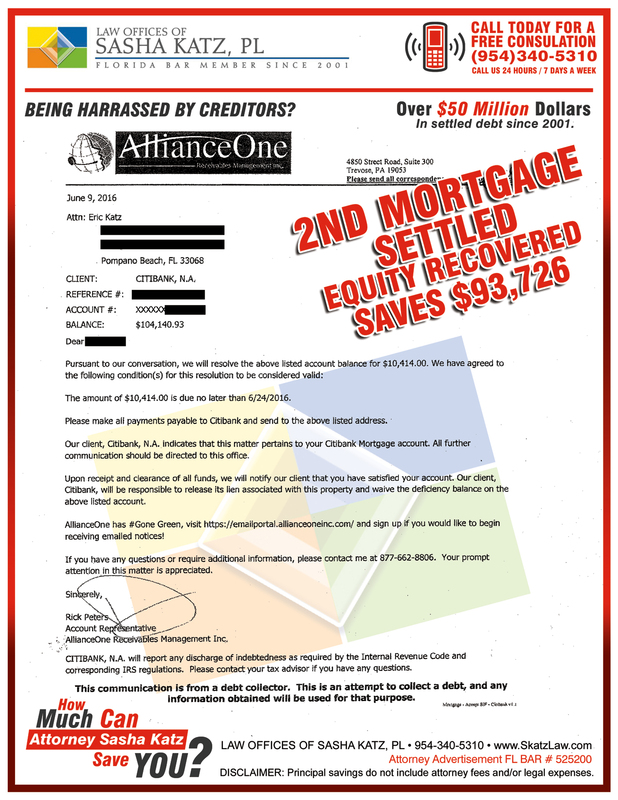 Eric immediately set out to get our second mortgage reduced to the lowest possible affordable amount. Once he felt comfortable that a settlement was near Sasha planned out a strategy for a modification of our first mortgage. What can I say but kudos for the Katz team . 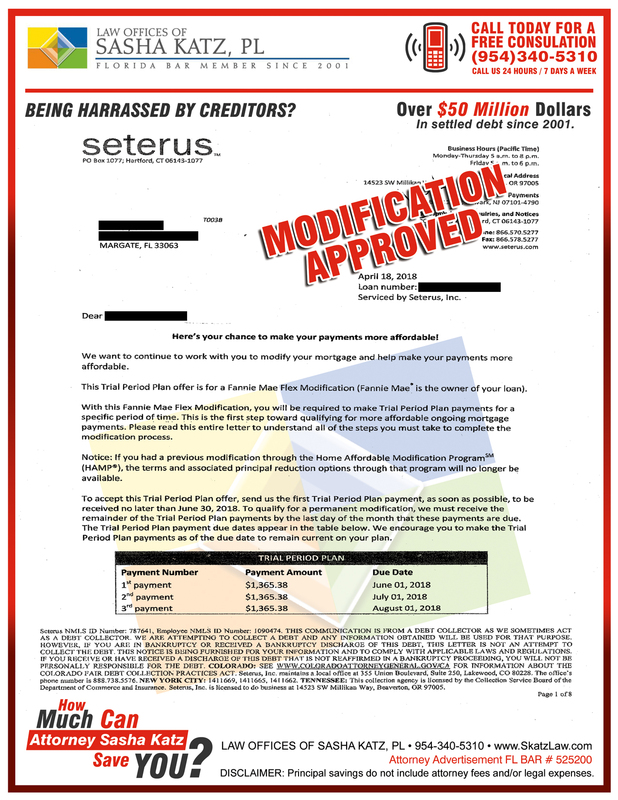 I now have my second lien finally settled and my first mortgage has been approved for a modification at an affordable payment.in addition I can’t forget Letty and Robin for their relentless dedication to making sure that all the documents that were needed were in place or else It couldn’t have been done. If you need professional help contact the Katz team. Thank you Sasha & Eric “Velvet Hammer” Katz. We know this was a complicated situation but it speaks to your dedication, perseverance and desire to complete the mission at hand. We are so grateful to have met both of you. We are rejoicing, we praise God, and we love you guys. I wanted to take a minute and impress upon you how happy with your entire team on the service we have and are continuing to receive. 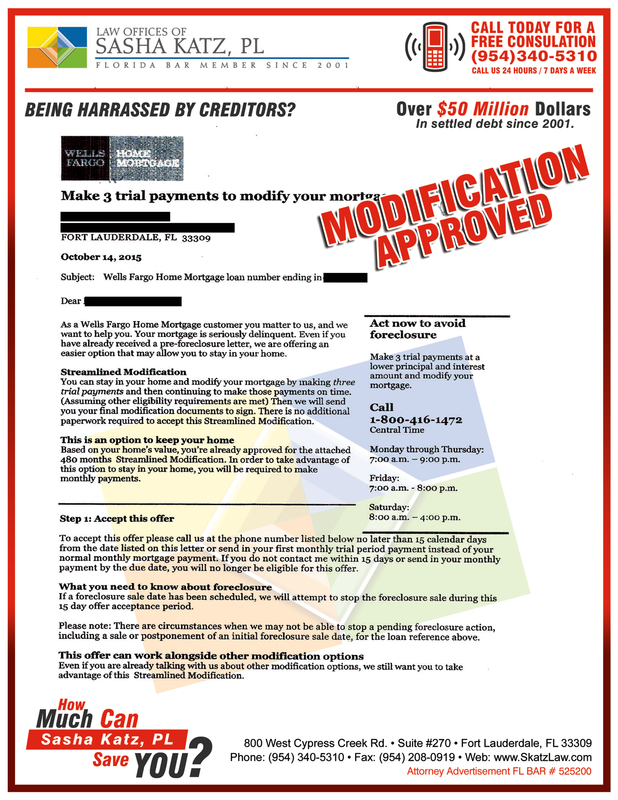 Starting with Eric’s initial work of helping us put together a viable modification package and walking us through the process to your incredible win in court(congratulations again!) your team has been exceptional. Additionally we could not have gotten this far in the process without Letty. 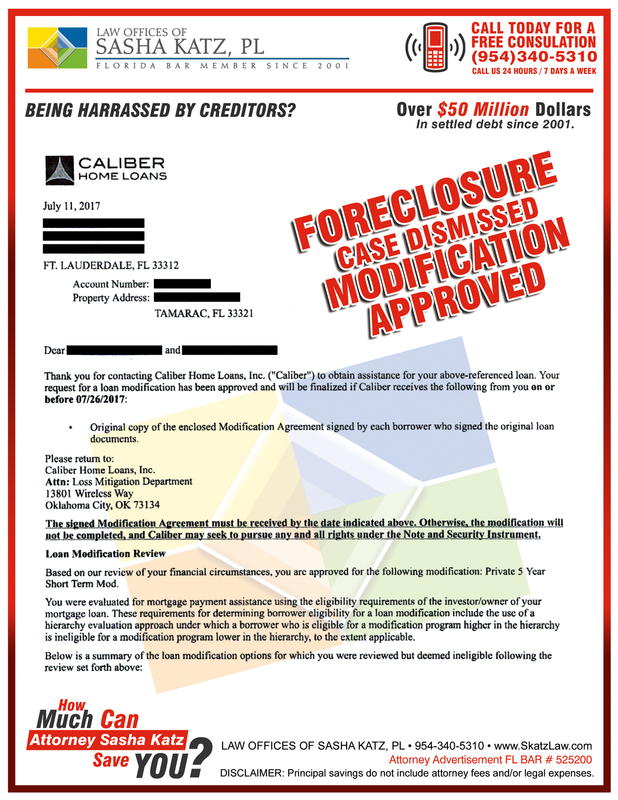 Her attention to detail and follow up with the lender in making sure all documents were received is phenomenal. She even handled my mild freak outs with the utmost professionalism. I am sure we still have a long way to go to get to a satisfactory final modification. The process has been grueling and we could not have gotten though it without your team. We would be most happy to recommend your services to anyone who asked. 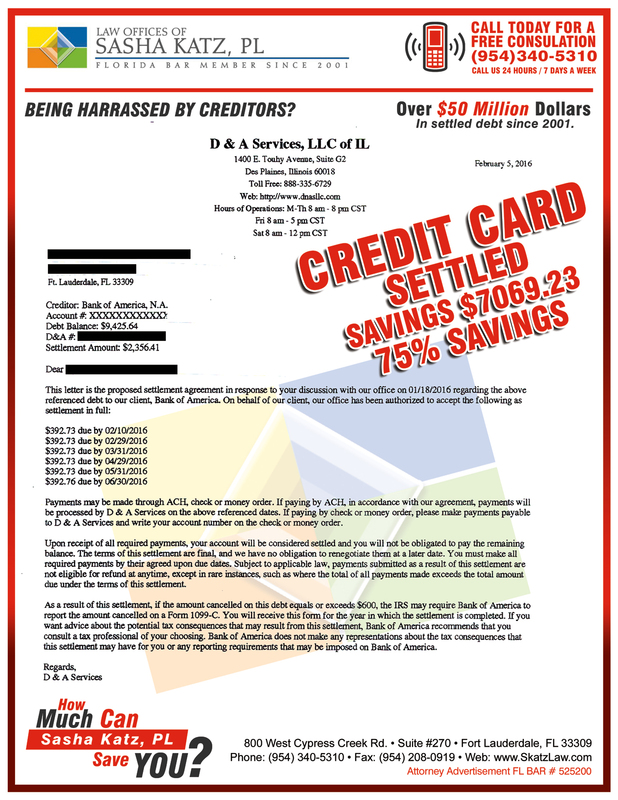 After researching claims that there were legal solutions to my financial troubles, I consulted with a dozen attorneys. 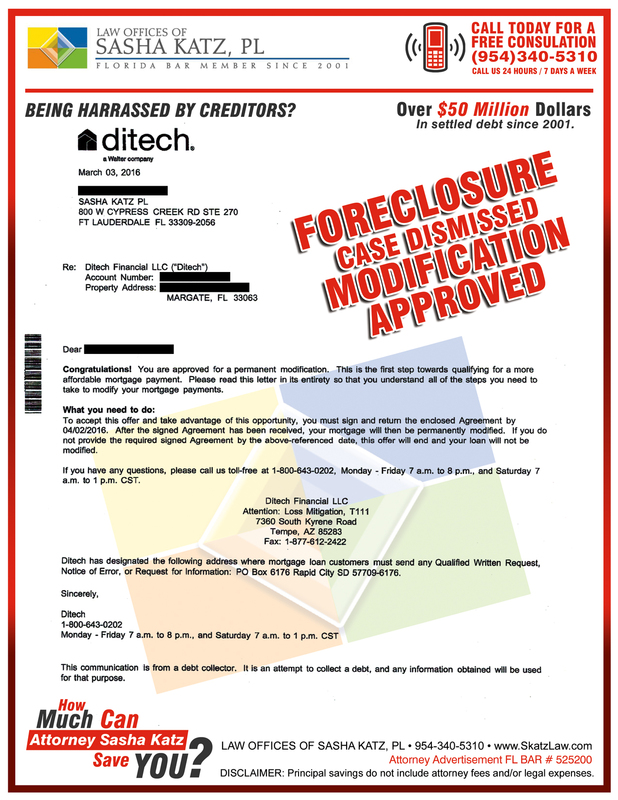 All told me that they could hold off the foreclosure for up to 2 years and that this was all I could hope for and it would cost me $500 a month until I was foreclosed on. I realized that none of these attorneys had a clue as to how to do the things I researched. Just when I was about to give up, I found Sasha and Eric Katz. They came highly recommended by an acquaintance who was a judge/mediator who said Sasha and Eric were the best there was in this type of law. They have completely changed our lives. We now have a bright future, good credit, and our house. Finding them was truly a miracle!!! 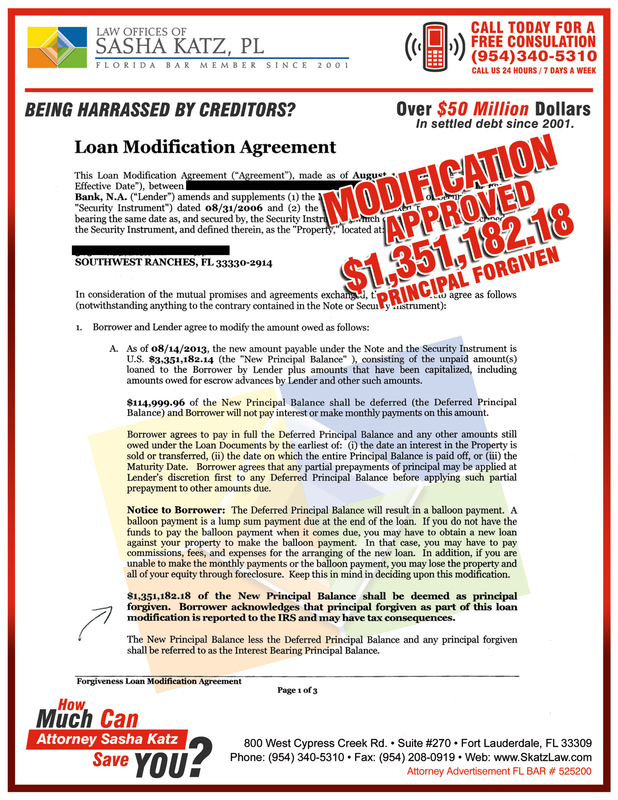 A legal problem involving a crucifying loan from a bank on my property was solved in a few months after I contacted the Law Office of Sasha Katz. No vain promises were made as I attentively listened to the course of action projected by the attorney. Confidently, I waited and saw that the office really works on my behalf. 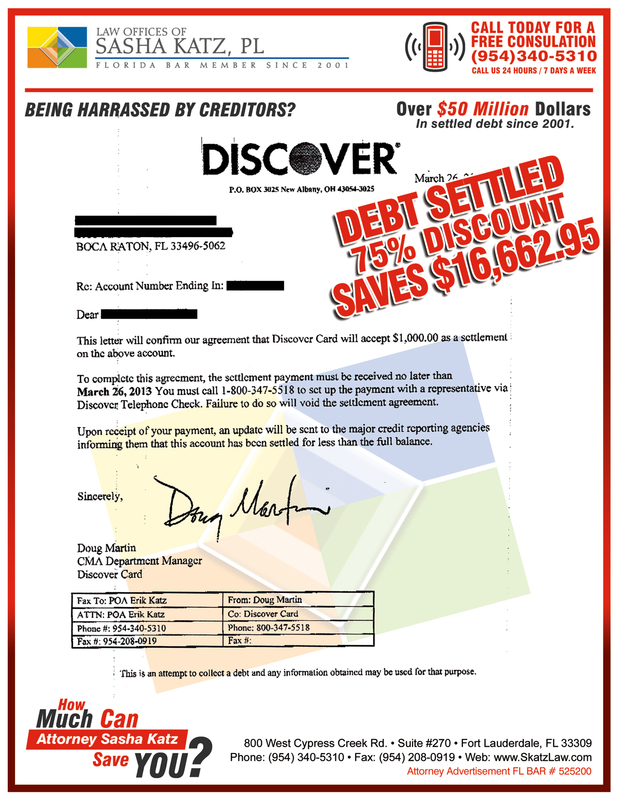 Delivery was made, and as of now these diligent attorneys have spared me many thousands of $$$ in bad debt. This is when saying THANK YOU is so meaningful. Saved us tens of thousands!! My husband and I are so thankful for finding Attorney Sasha Katz. 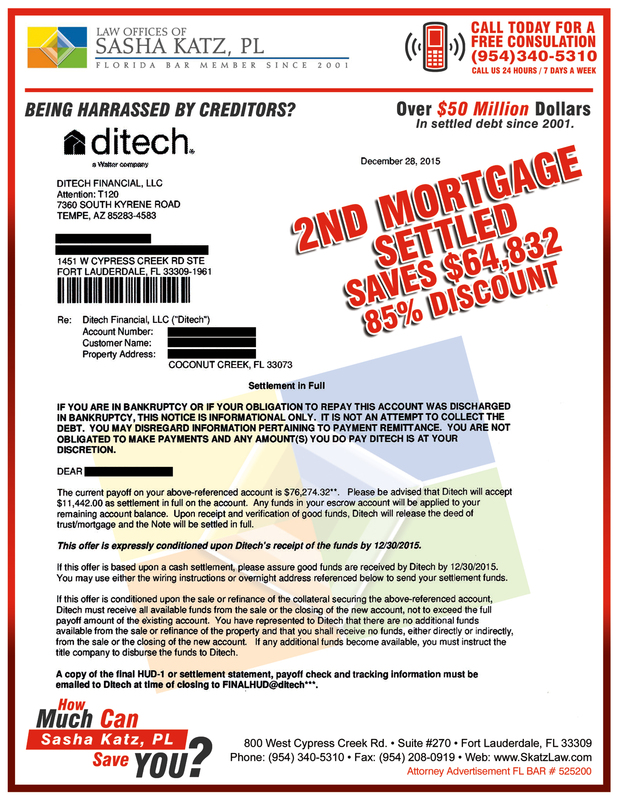 We were in over our heads in debt and totally upside down with 2 mortgages on our house. Drowning…. 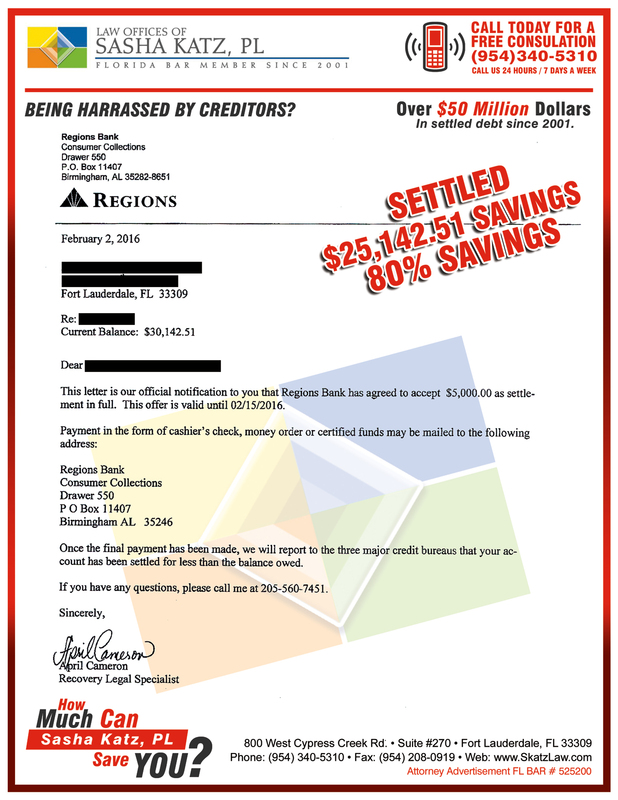 They made it so easy for us and helped us negotiate 3 credit cards down to a very manageable balance. 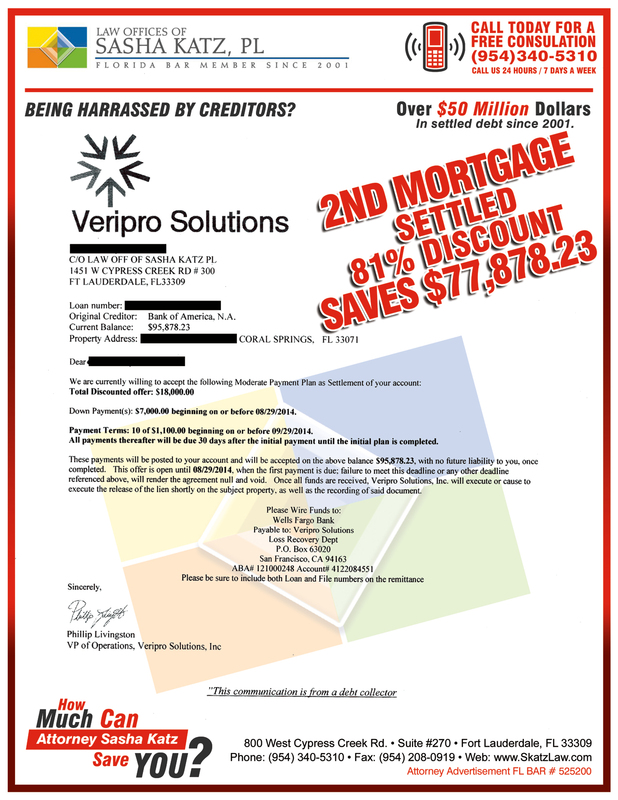 Then with our patience and their tenacity, we were able to save over 80k on our second mortgage! Lifesavers! I would refer them to anyone!! They are awesome!! Excellent Service! 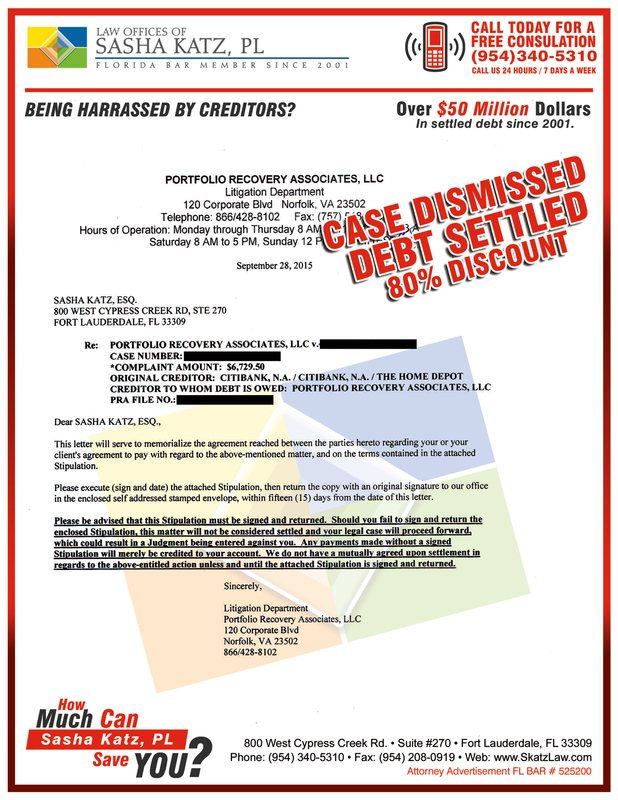 I was very satisfied with the service and the results of working with Sasha Katz’s law firm. I was very comfortable working with them, and bottom line, they got the job done! I would not hesitate to recommend them to anyone I know! Great experience, and great results!! Sasha and her team consistently exceeded expectations on all fronts. Due to their efforts, I was able to gain a very favorable outcome. Sasha is not only a tremendous attorney, she also brings a keel of compassion and understanding that is rare in her profession. I would gladly recommend her to anyone needing help. Sasha was referred to me by a lawyer I know. She reviewed documents for me related to the purchase of a home. She was a pleasure to deal with and I would highly recommend her to anyone using her for any real-estate related transaction. AVVO TESTIMONIAL – I had a very good experience working with Sasha Katz and her team. 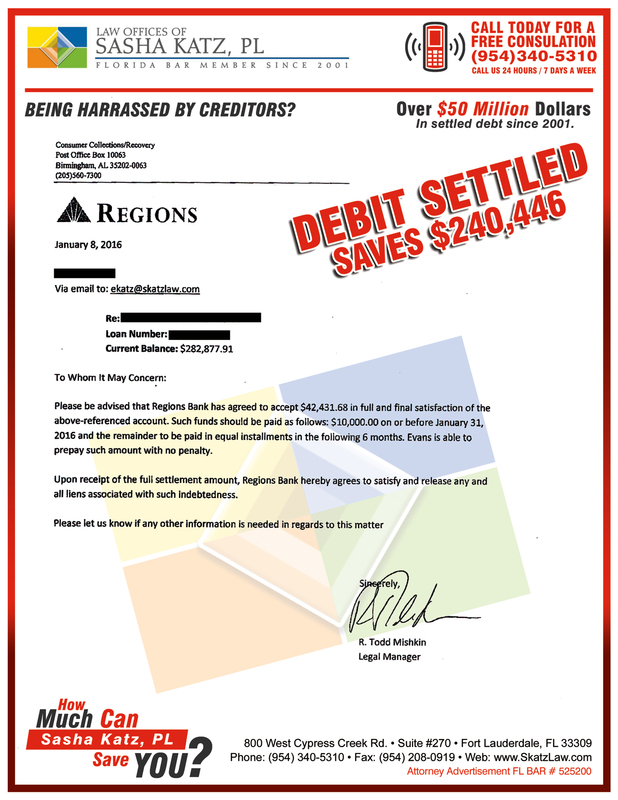 They were able to negotiate my accounts to complete satisfaction. I feel their service fee was well worth the assistance. As a Realtor, dealing with Sasha katz to handle all my closings is always a seamless task. My clients are fond of the impeccable service they receive. Dealing with many foreign transactions from overseas Sasha always ease my task . Communication is amazing ,her integrity and hard wor is deeply appreciated. 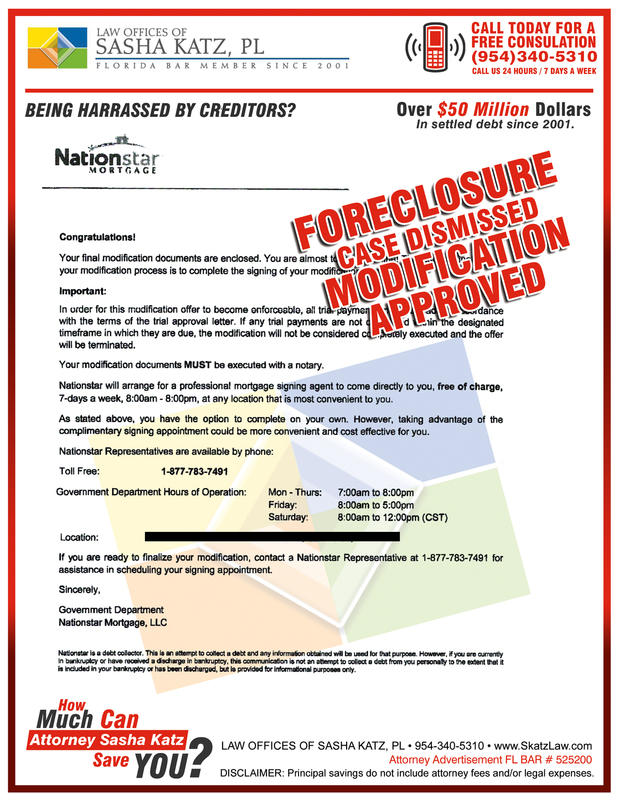 In a short period, through her prompt attention, Sasha has managed my foreclosure defense while assisting me with a loan modification. My case is still winding its way through the bureaucracy, but through Sasha’s help, I feel relieved and confident, and a little more in control. More than her professional efforts, in our current culture riven with crass greed, dishonesty, and uncaring, she is remarkably forthright, gentle, and considerate. She is positive without making wild promises. 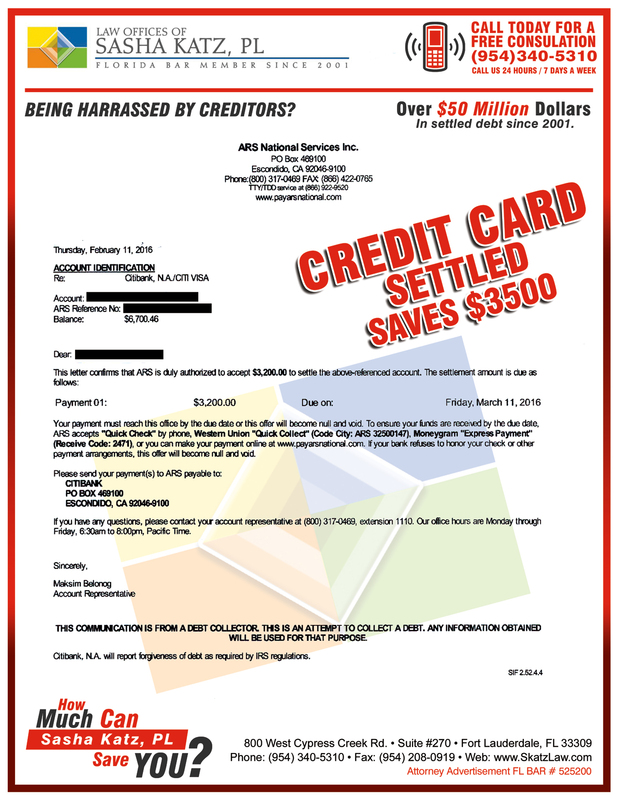 Recognizing by genuine situation she is working with me on an affordable payment arrangement. 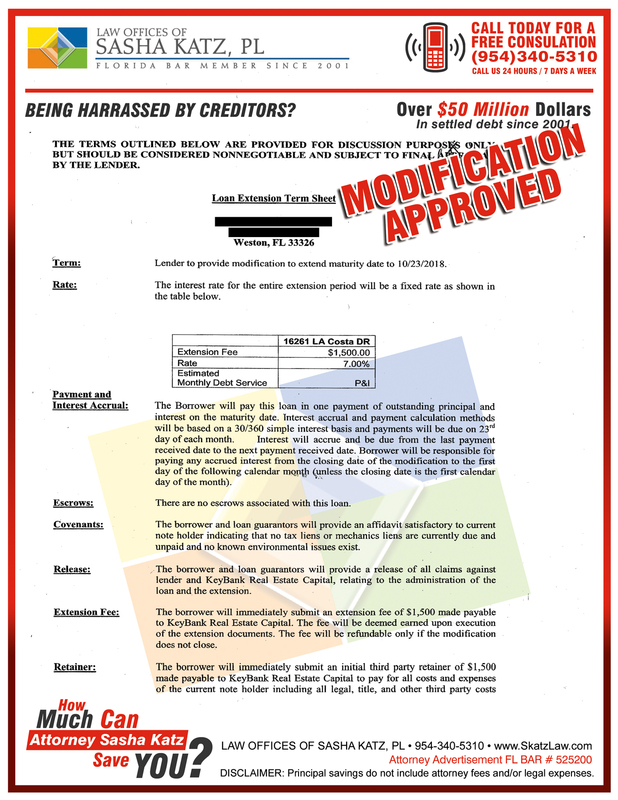 She is knowledgeable and up-to-date in her expertise and experience of the byzantine mortgage and credit industries. She is available to answer all of my questions and reassure me with confidence and hope when I panic. 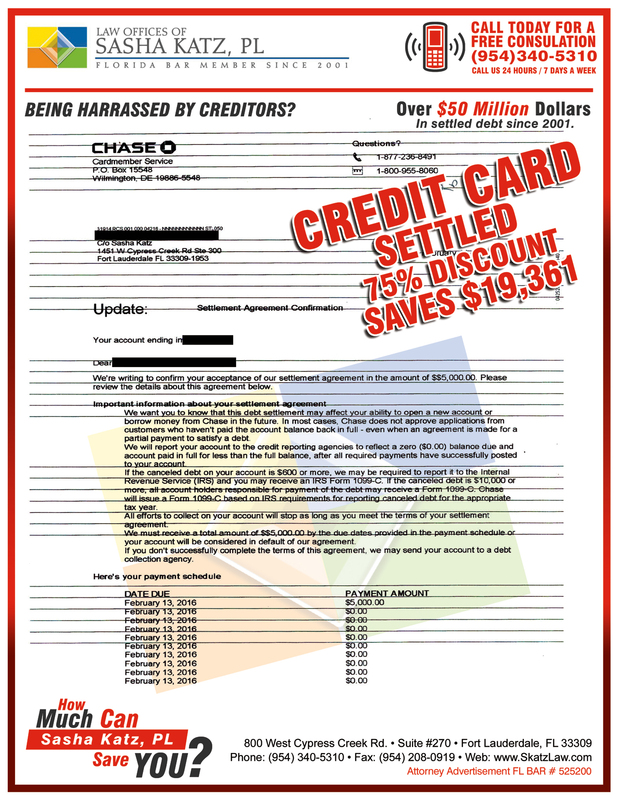 All of her transactions are transparent and easily monitored via e-mail and the internet. She is prompt in her responses and when I call, she always returns my calls promptly. I cannot say enough about how much her calm and reassuring support has meant during one of the most stressful times. 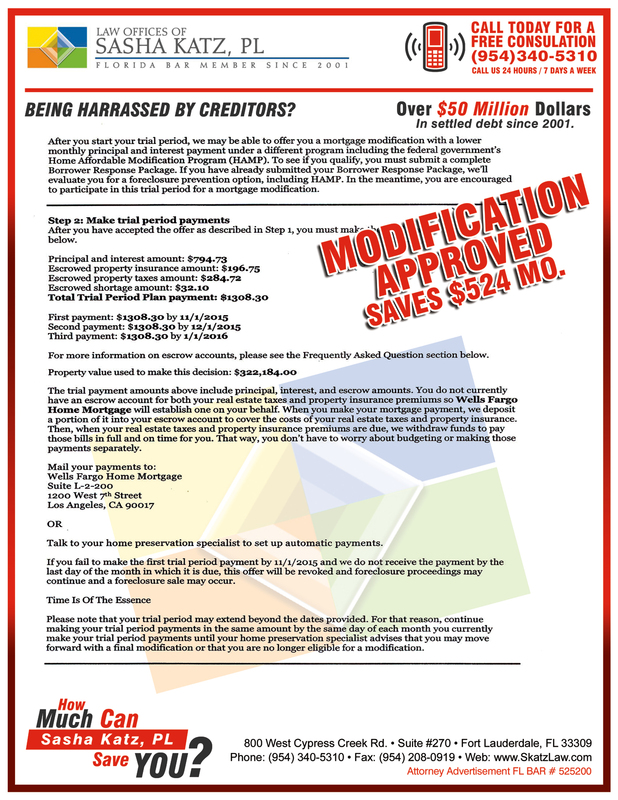 If you are up against the banking, mortgage, and credit industry and you need professional assistance, save yourself a lot of time and stress – consult Sasha Katz without hesitation. I recently hired Sasha Katz and after working with her team I was impressed how efficient the office did their work. 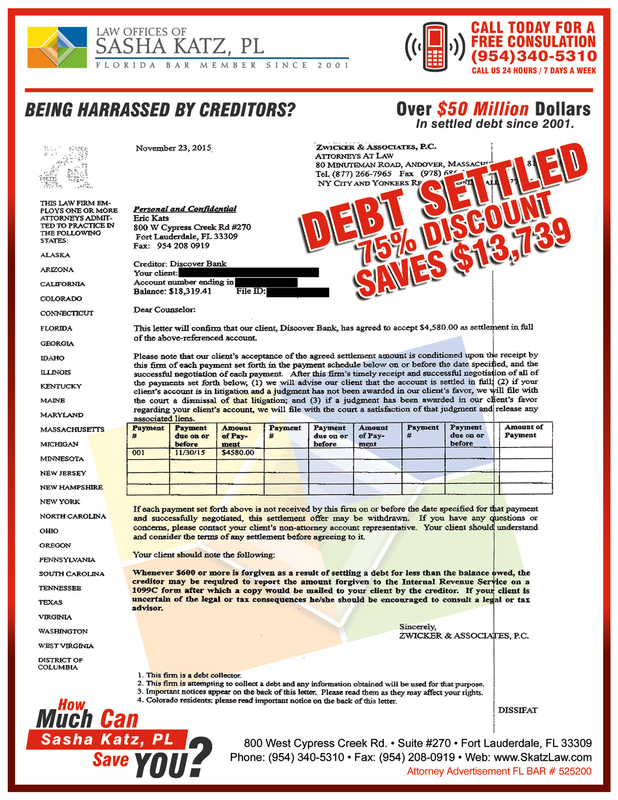 I was told of my options and fees before and everything went smoothly. I bought a condo and Shasha was the sellers attorney. There were a lot of issues with the short sale and I found her to be very helpful and very efficient in her many dealings with me. When I will need an attorney in the future I will certainly use her. Today is the day of reckoning with my bank. After months of waiting for their lengthy process. 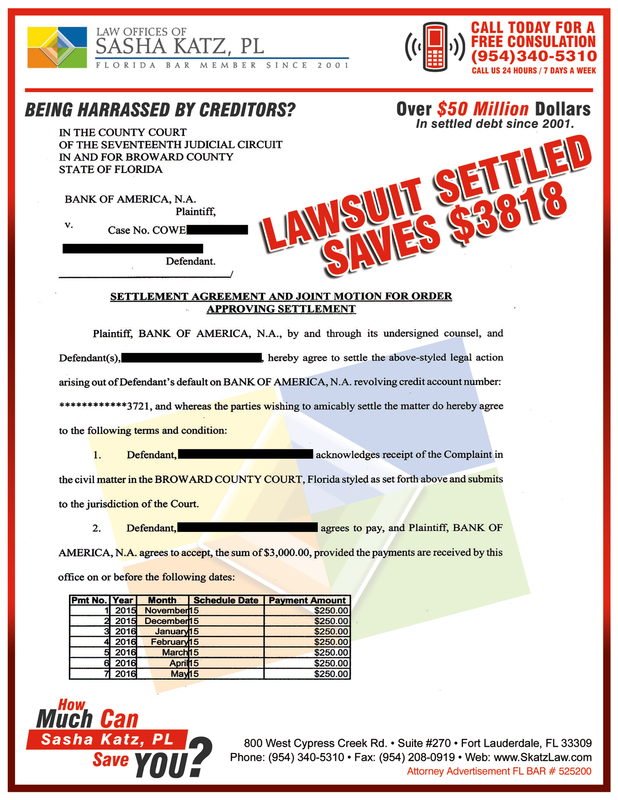 My attorney Sasha Katz prepared all the paper work and was in contact with banks at all times communicating with me of their progress or my progress. I am glad I had a qualified attorney to quarter back the process. I would have lost my cool along the way. 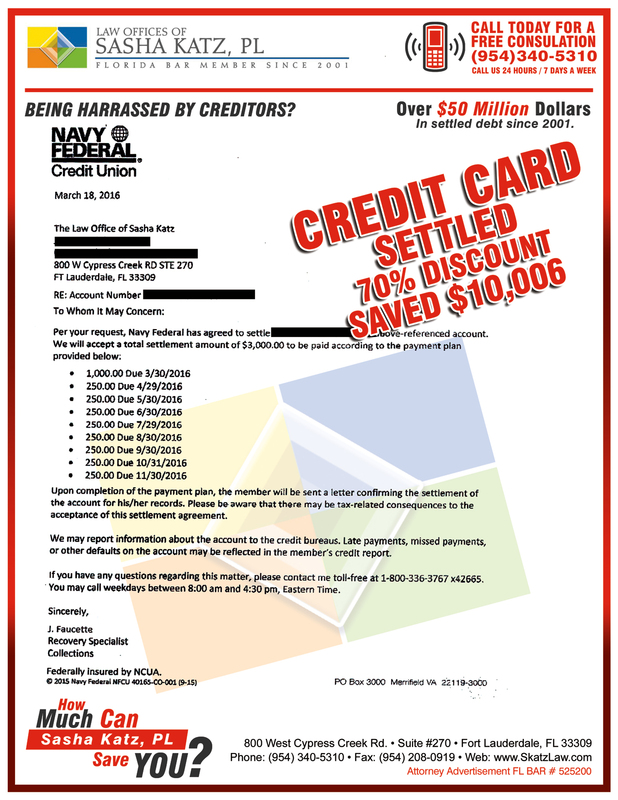 I have no doubt that Sasha can work with bank to help facilitate any complicated real estate transactions. I want to thank you for the help with the “short sale” of my villa after the passing of my husband! Your service was very professional, empathetic and simple. I was very nervous about the process, but after our initial meeting I realized that you had a tremendous amount of experience even in this terrible housing market. Your service certainly exceeded my expectations. I guess I got lucky that you were referred to me by someone else. This speaks volumes of how well known you are in South Florida. I had total confidence in your work! I was pleasantly surprised by the level of service I received from Sasha Katz. Negative occurrences usually produce negative thoughts. When I thought the worst, Sasha was able to put my mind at ease by articulating the possible as well as the probable. At no time did she paint a different color of the reality. The thing that I like most was how responsive she was with regards to communication. Thanks. 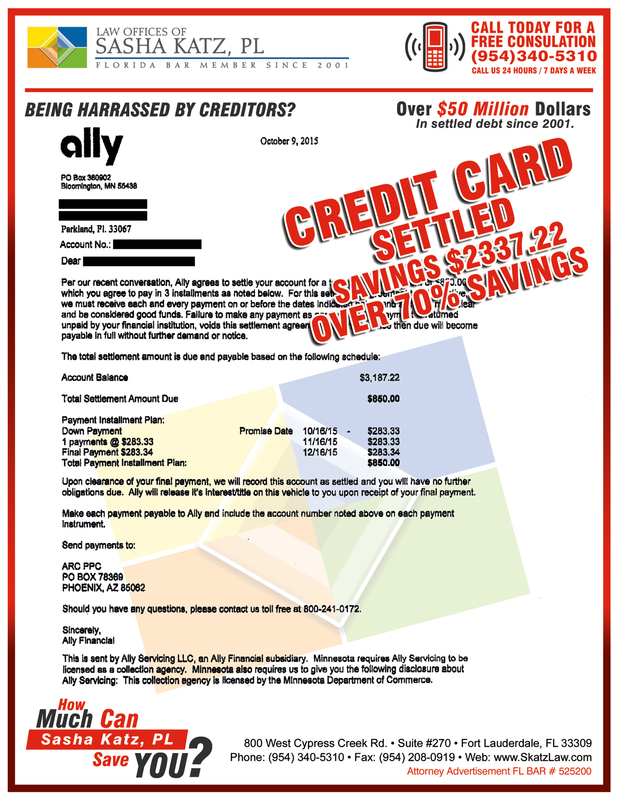 Two years ago, my family began having financial difficulties. 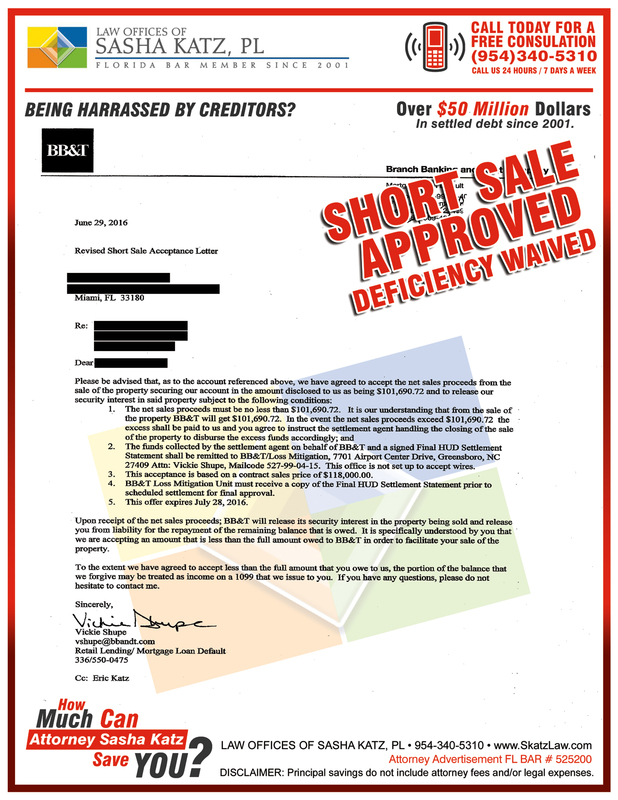 We were referred to Sasha Katz and we decided to sell our home by Short Sale. The process beggining to end took approximately 3 months. We wish we could of contacted them earlier. The staff is very knosledgable and friendly. Today we sold our home and our we do not owe anything to the bank. Thank you Sasha and Eric for your hard efforts and determination. Dear Sasha and Eric – I want to thank you for all you have done for us and for all you are still working on. Last May 2011 I became ill and was not able to work for 3 months. This created a severe hardship as we had already been struggling for several years and with 3 kids we still have many challenges ahead of us. 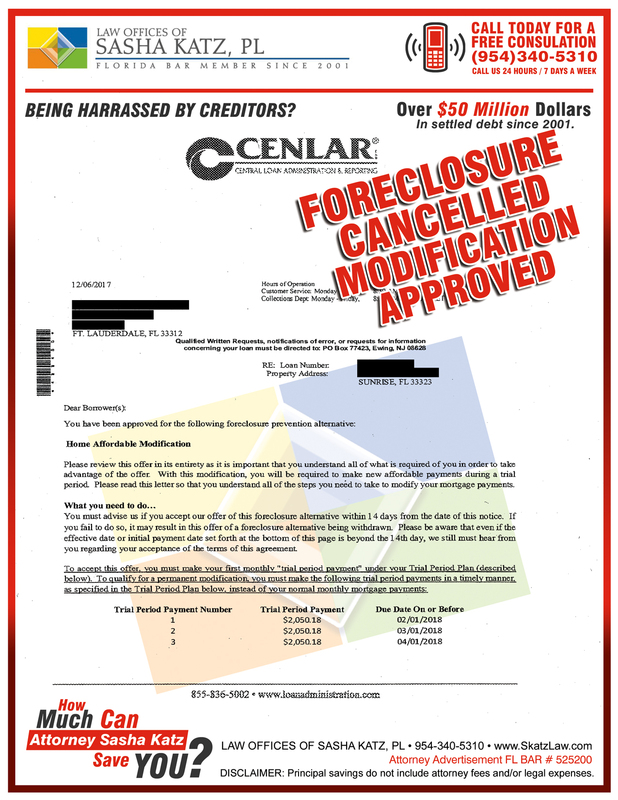 Our debts piled up, our real estate investments faltered and our home was in jeopardy of falling into foreclosure. p.s. You are our attorney for life! The service and personal attention that I received at the Law Offices of Sasha Katz was amazing. 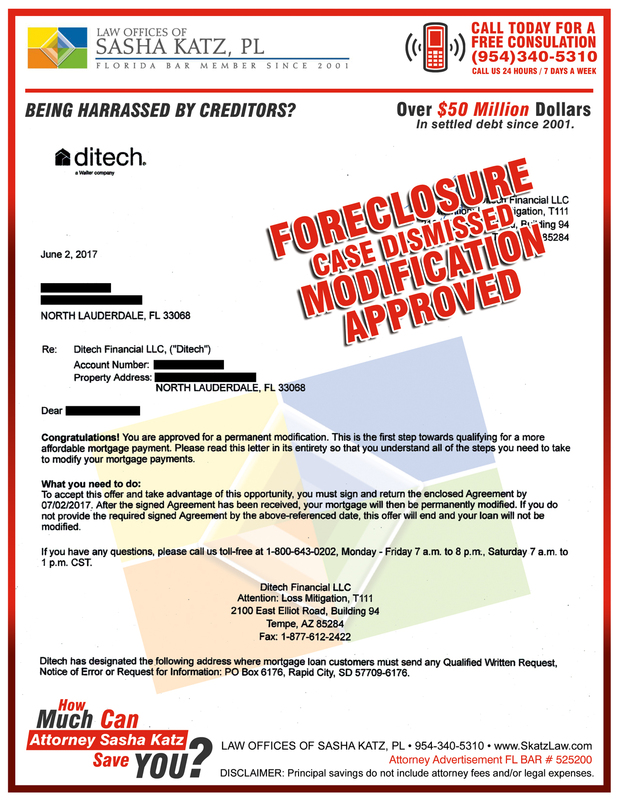 I had been enduring a very difficult time while dealing with owning a home that was under water over 50 percent of it’s original value. I began to think that there was no hope for me until I was introduced to this law firm by my realtor. 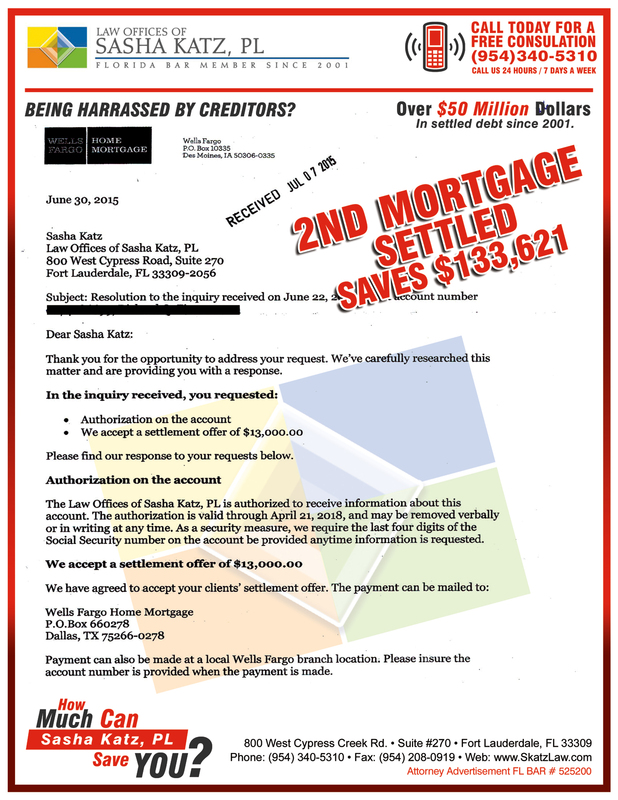 They were able to work out a deal with the bank that held my mortgage and to my surprise the wonderful people at Sasha Katz Law Offices, were able to get the short sale of my home approved. 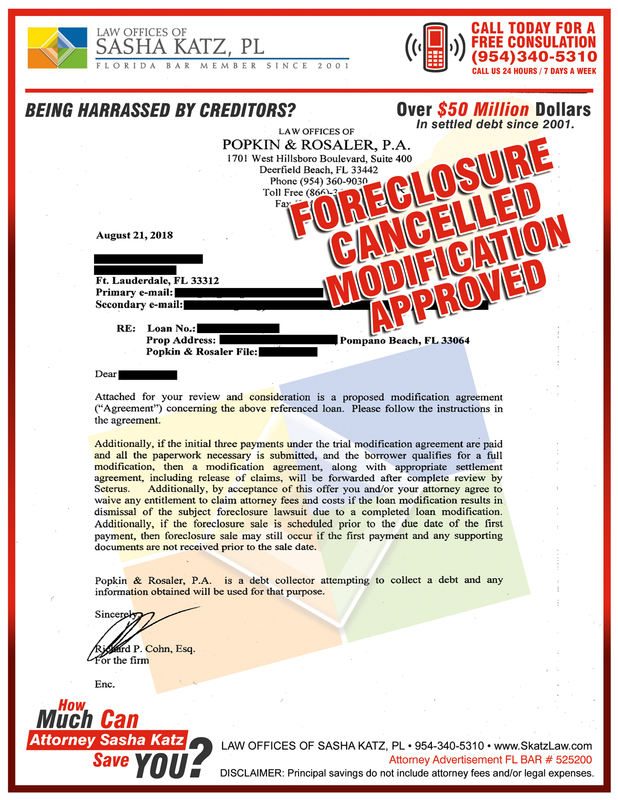 To top things off, they were also able to make sure that I received over thirty thousand dollars in moving expenses, which the bank promised once the requirements were met for the short sale. 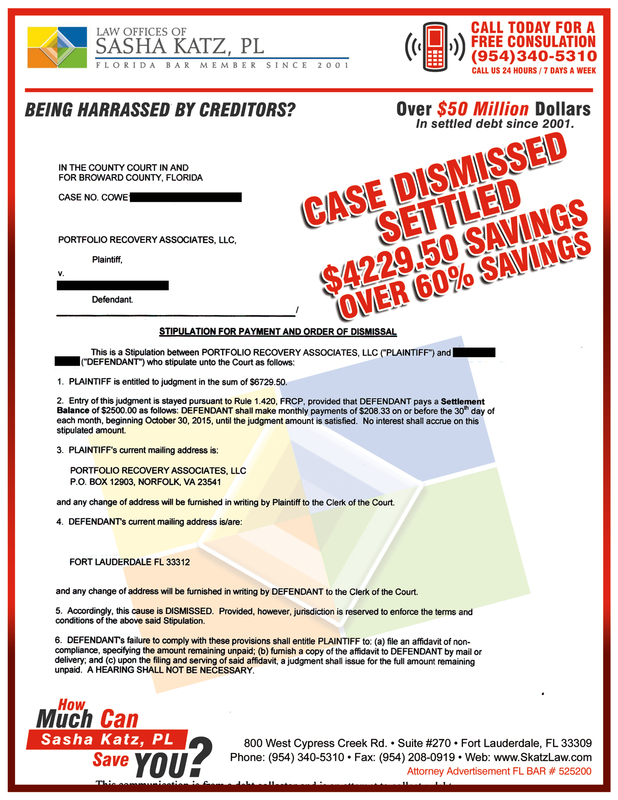 Sasha Katz Law Firm stood by me every step of the way to make sure that this process went as smoothly as possible. They helped me turn a negative situation into a positive outlook, with a new beginning. For anyone who may be stuck in the same or similar position and feeling like there is no way out, let Sasha Katz Law Firm be your reason to believe again! 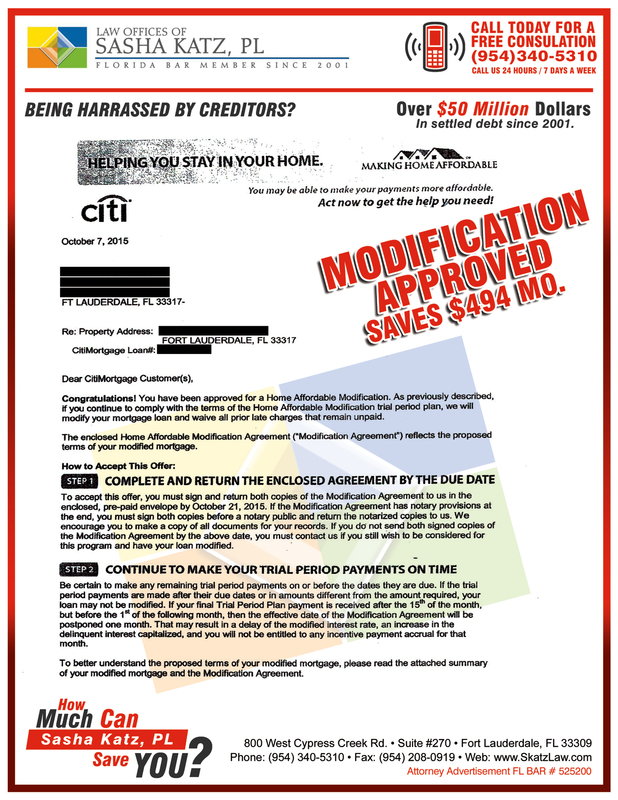 To ERIC – I received the modification approval from Wells Fargo this morning! You are the greatest & thank you for always being available to listen. I will always keep your law firm for further assistance when I need it. Thank You. Thank goodness for “Sasha Katz” she is amazing. Never met a short sale I couldn’t close with her great negotiating skills, tireless work ethic and down right determination to get it done.” I wouldn’t think of not working with her and recommend her to everyone I meet and I can do it with confidence.” Nine years in Real Estate and it is pleasure to have her on my side. 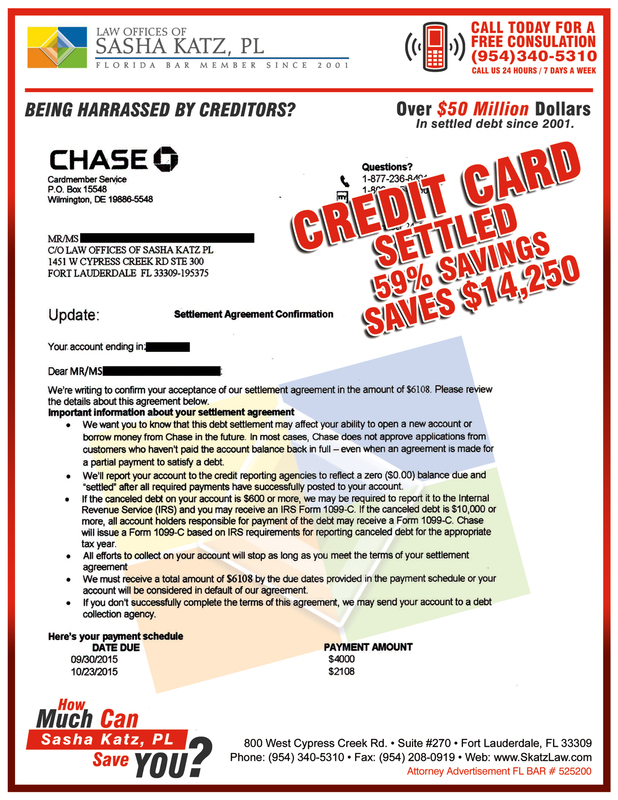 It is with sincere appreciation that I write this letter to Law Offices of Sasha Katz in gratitude for your excellent negotiations in settling my personal credit card accounts. 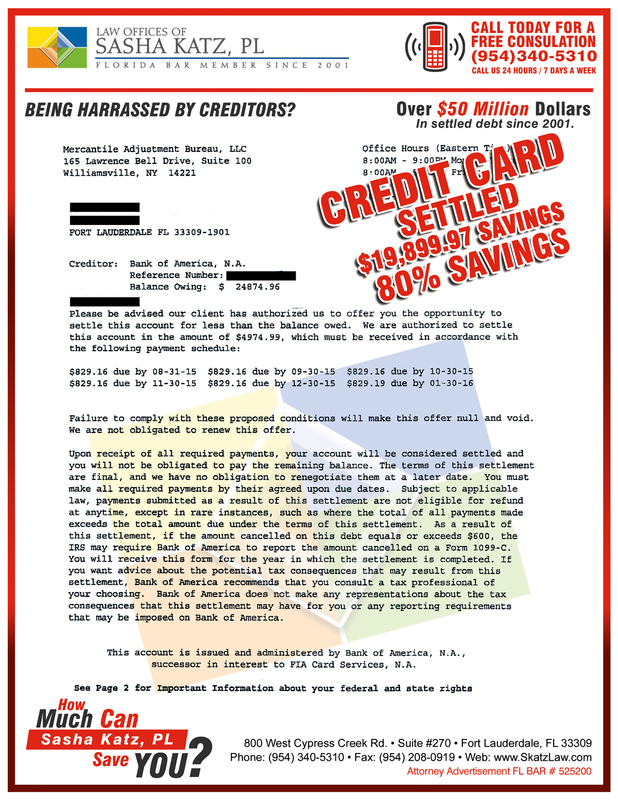 Your office has spared me the ultimate financial distress by preventing me from filing for personal bankruptcy. 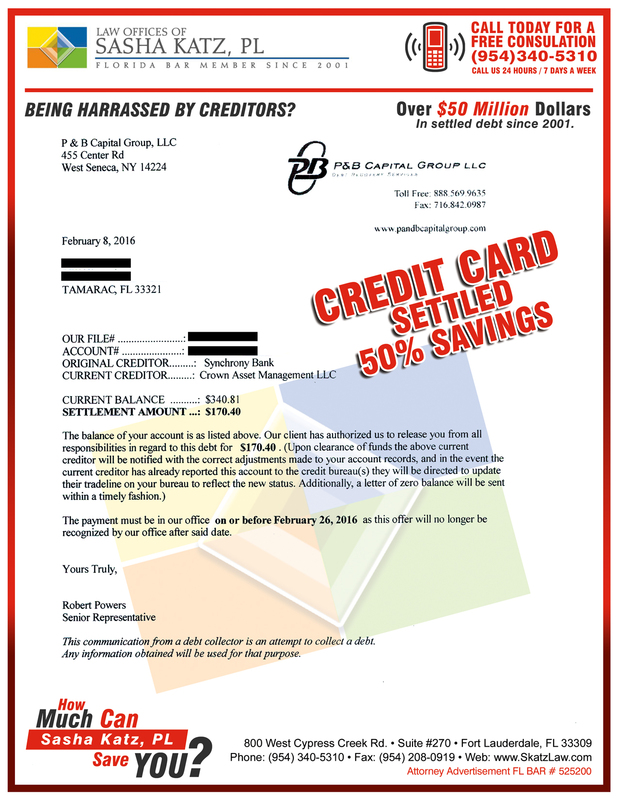 Your efforts have given me a new opportunity to rebuild my financial status and move forward in a positive manner. 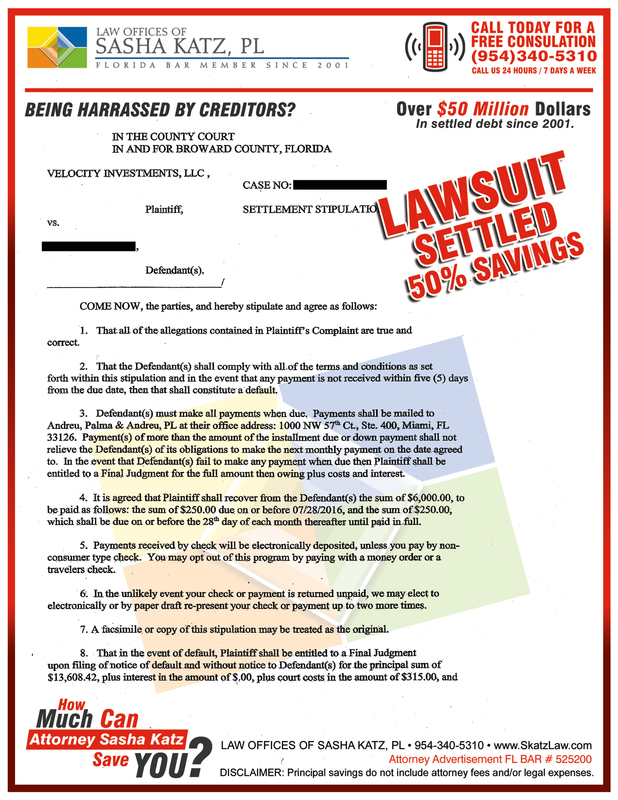 I had initially tried to negotiate a settlement with my creditors and the proposed settlement amounts they offered were impossible to pay off in any timely manner. Sasha Katz is an extremely qualified and professional attorney. 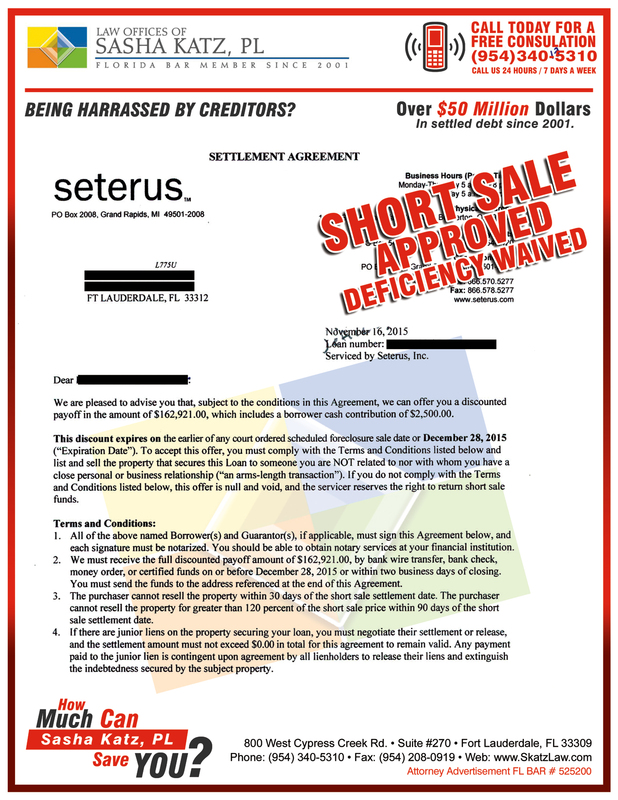 She assisted us in the purchase of a home within the short sale process. During this extremely stressful situation, Ms. Katz was always able to provide us with reasoned advice that calmed my wife and I during the process. I would highly recommend her and her team to anyone needing real estate law services. Your the Bestest lawyer in town? 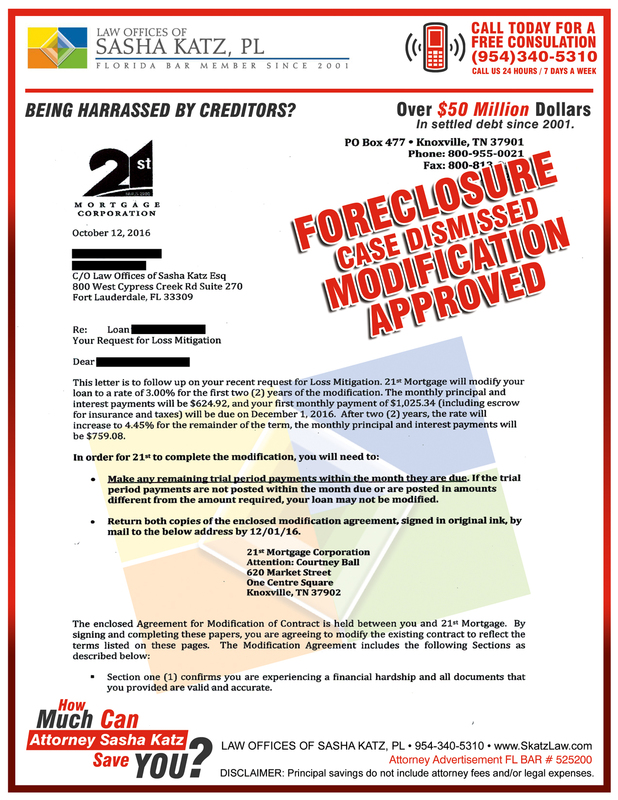 What can you say when someone literally SAVES your home from foreclosure. My wife and kids would have been out on the street with nowhere to go. I had everything to lose. 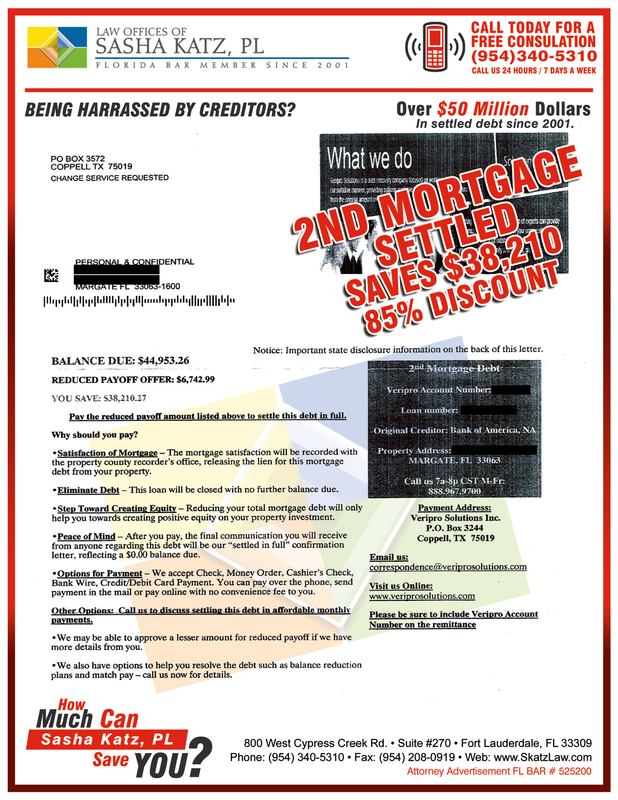 Somehow, Sasha and her team were able to modify my loan and wipe out a considerable portion of my negative equity. So, putitng my THANKS into words is hard because words cannot express the gratitude that I have for Sasha. She changed everything for me. Great friendly staff. Highly recommend. 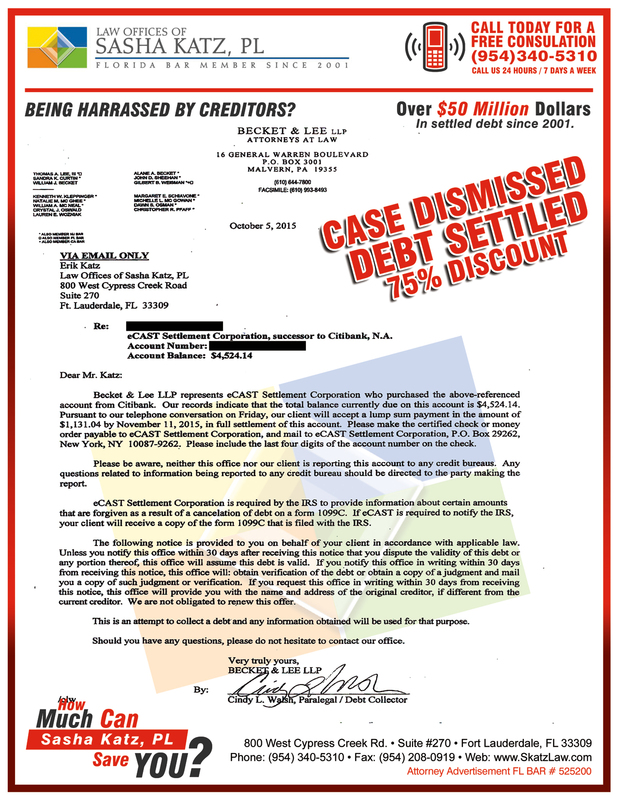 I have also referred other’s to their services and thanked me for letting them know about Katz Law offices. 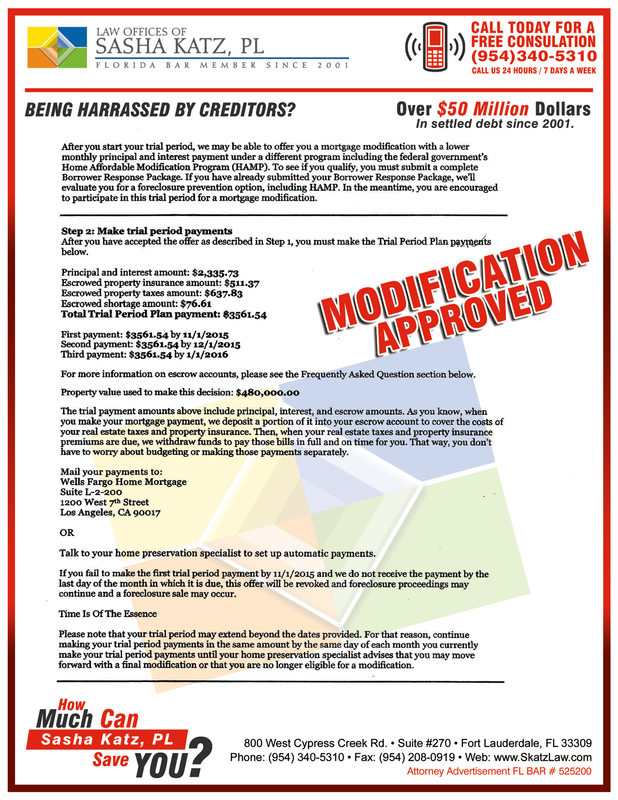 LEGAL DISCLAIMER – This web site is designed for general information only. The information presented at this site should not be construed to be formal legal advice nor the formation of a lawyer/client relationship. The hiring of a lawyer is an important decision that should not be based solely upon advertisements. Before you decide, ask us to send you free written information about our qualifications and experience. By clicking “Submit” anywhere on the site, you agree that we may review any information you transmit to us. 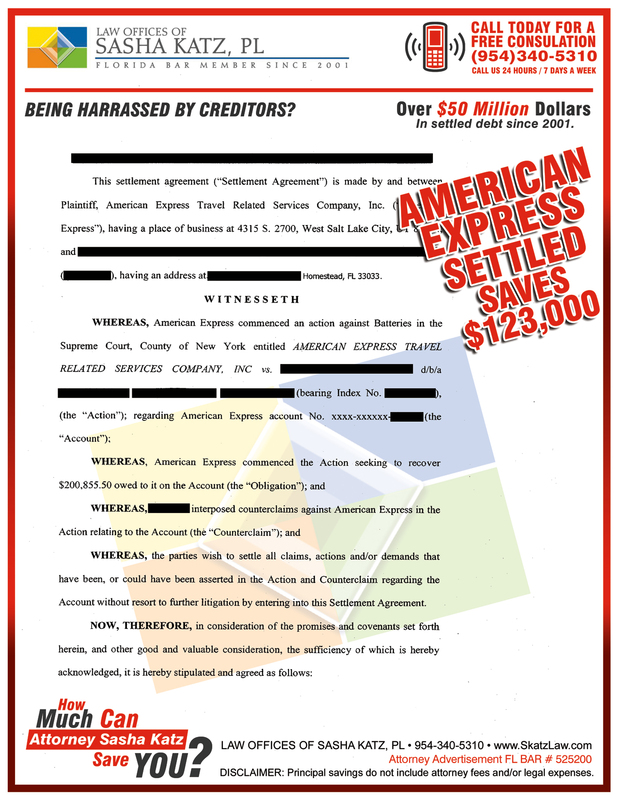 You recognize that our review of your information, even if it is highly confidential and even if it is transmitted in a good faith effort to retain us, does not preclude us from representing another client directly adverse to you, even in a matter where that information could and will be used against you.